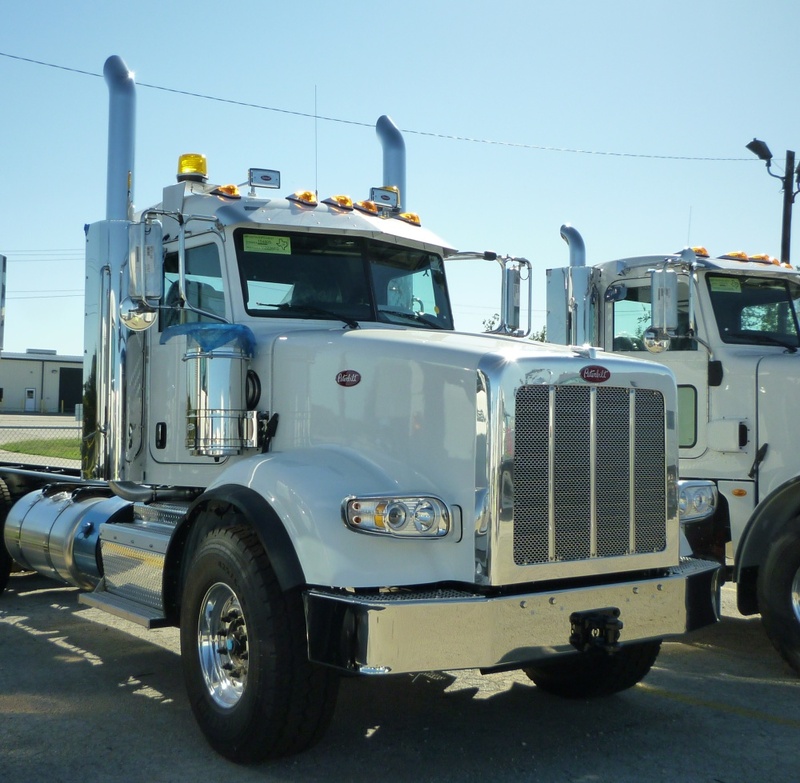 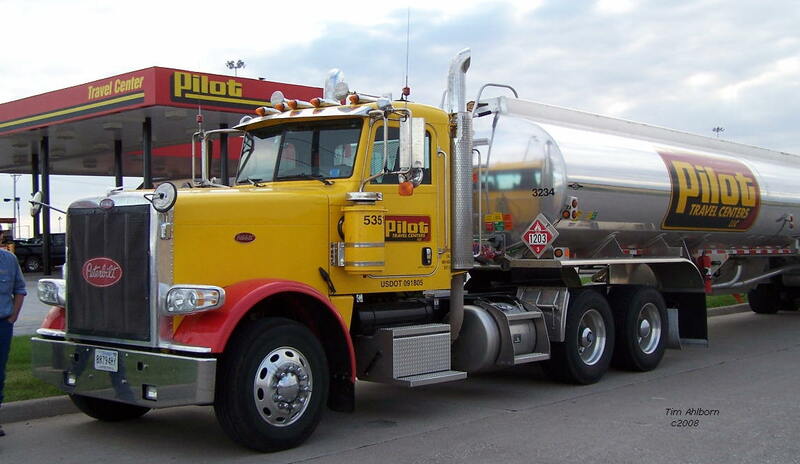 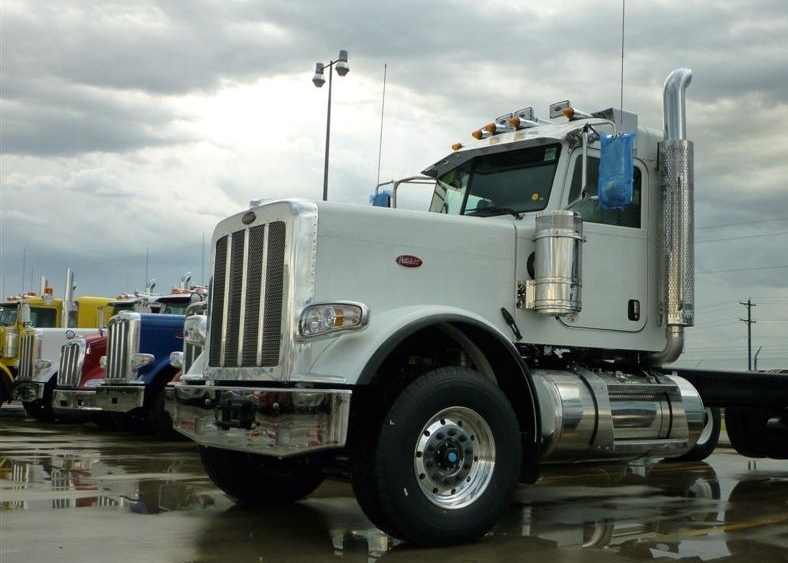 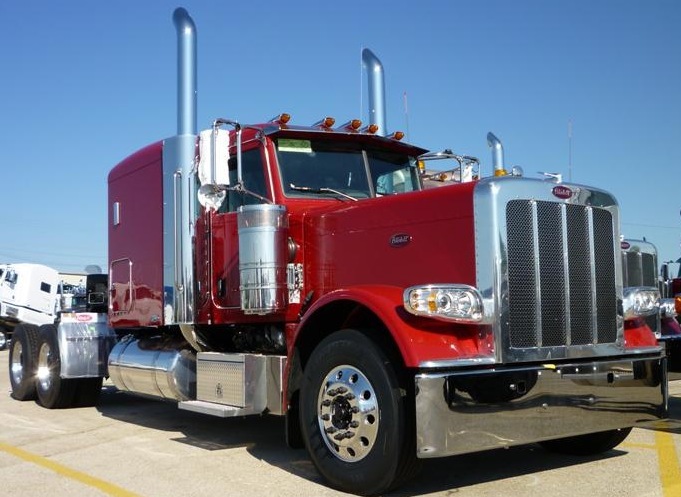 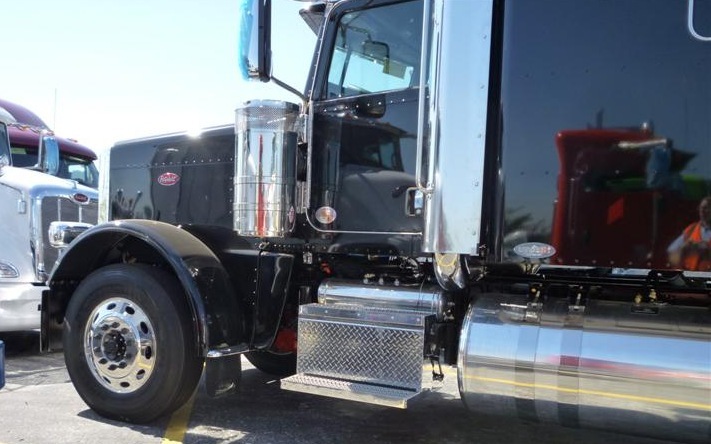 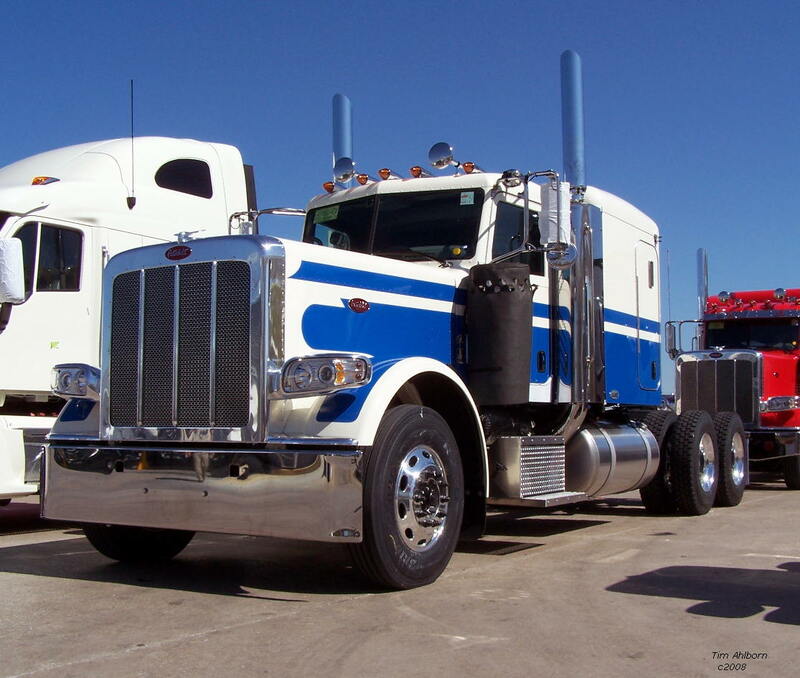 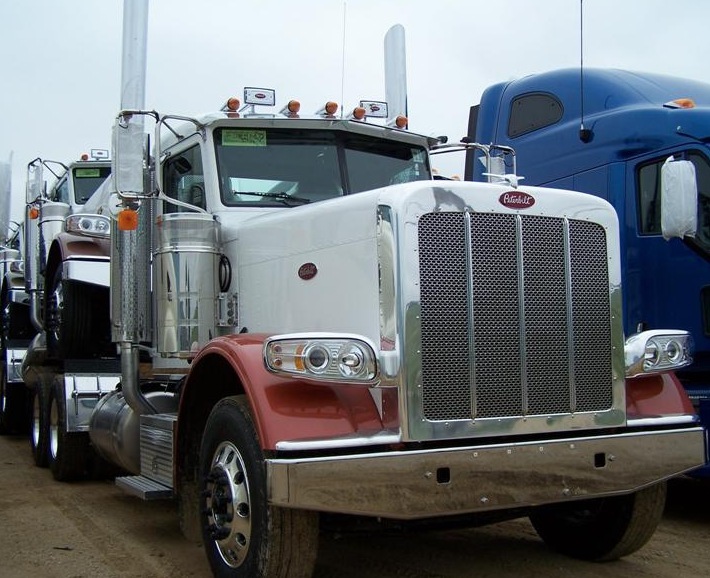 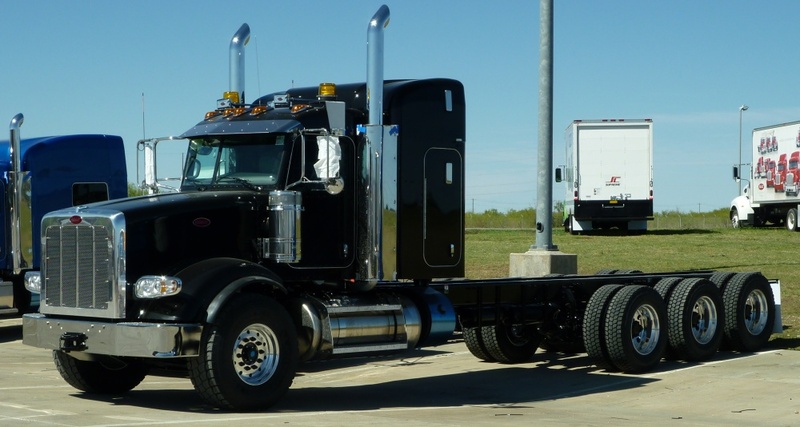 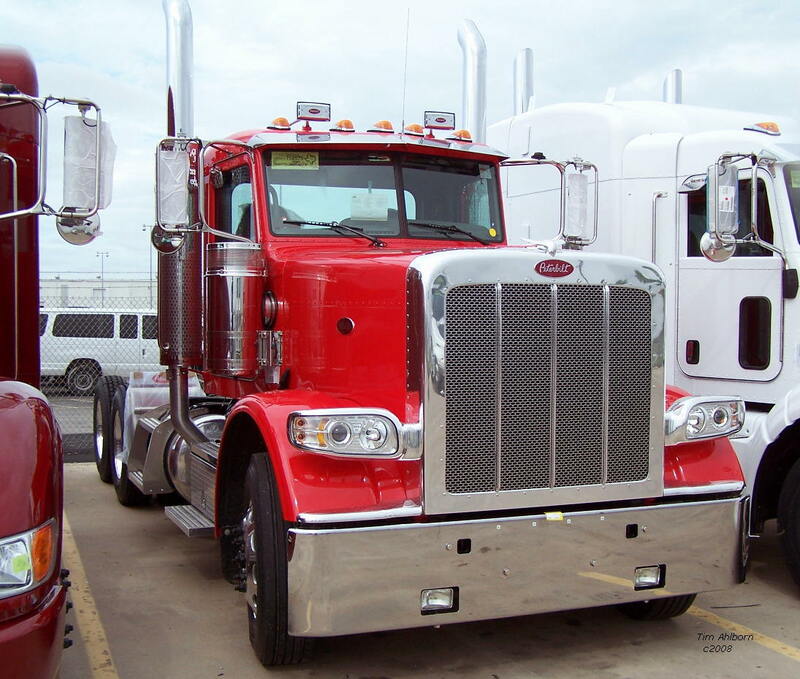 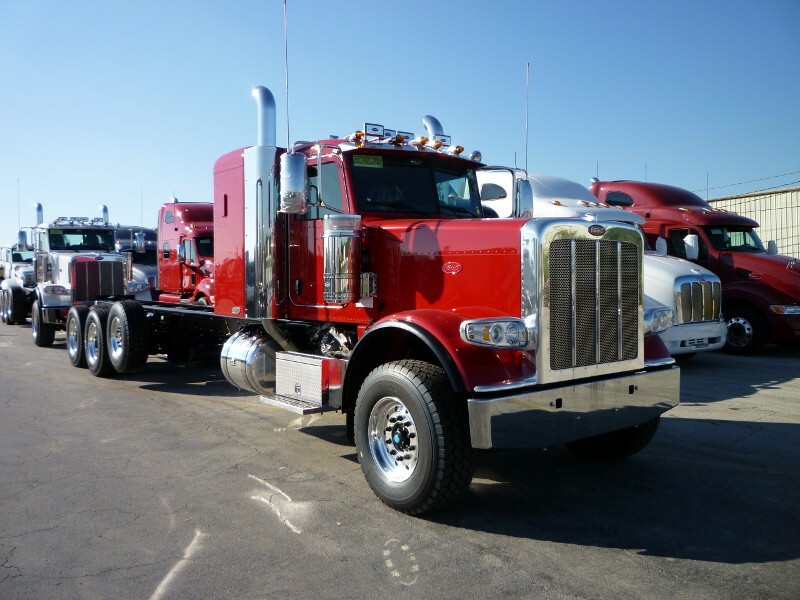 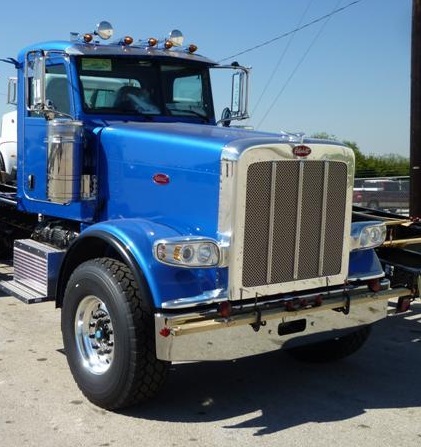 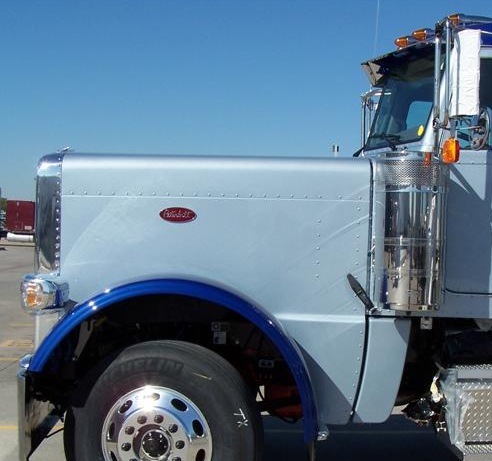 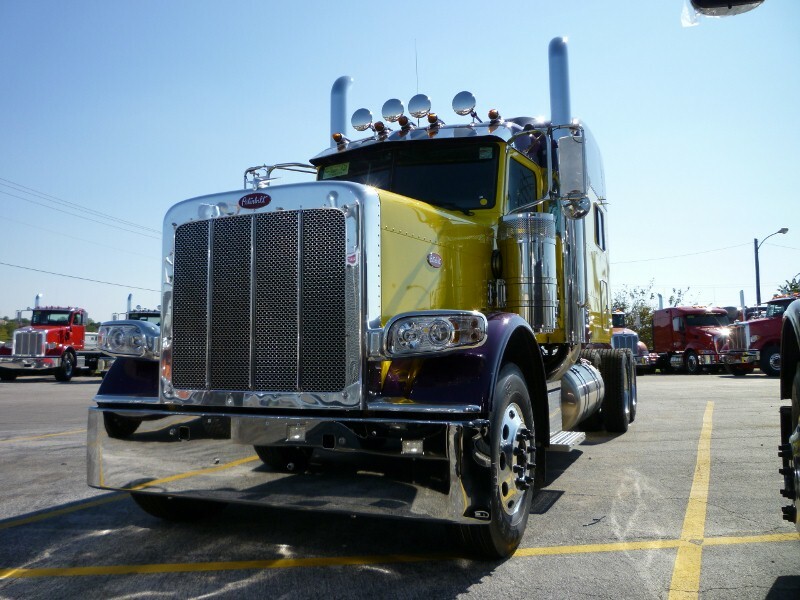 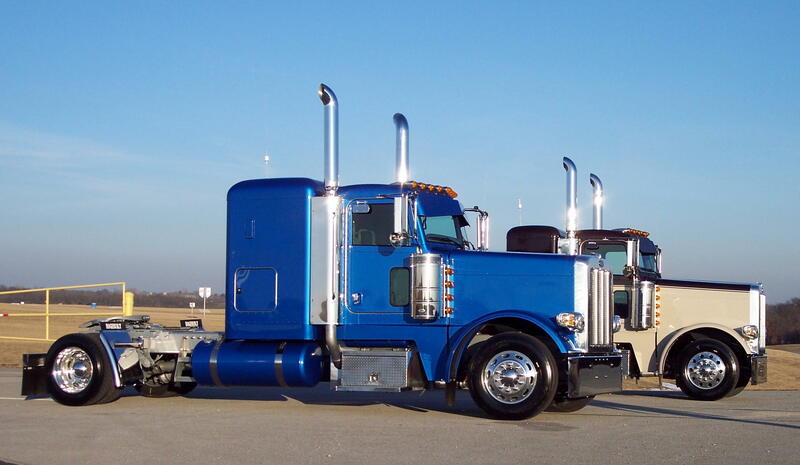 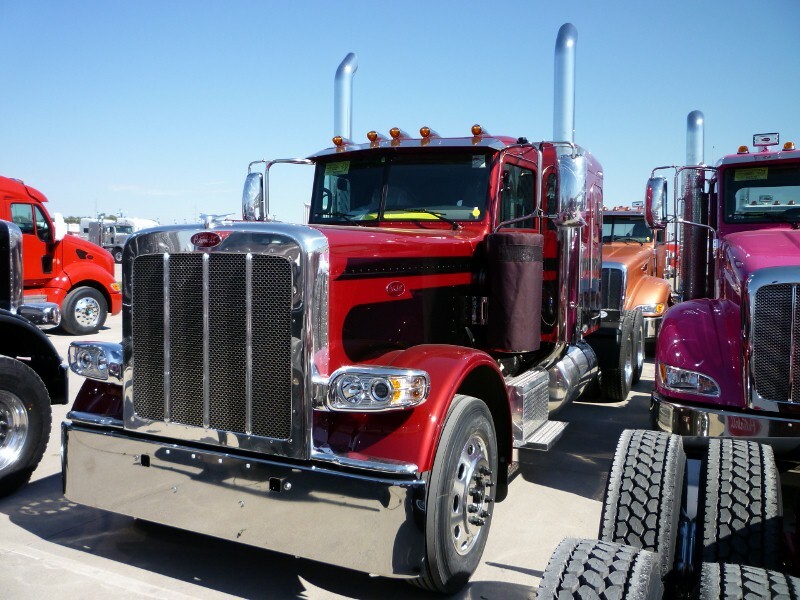 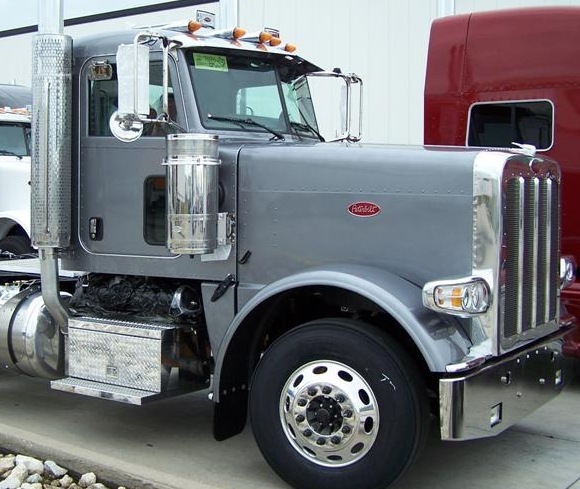 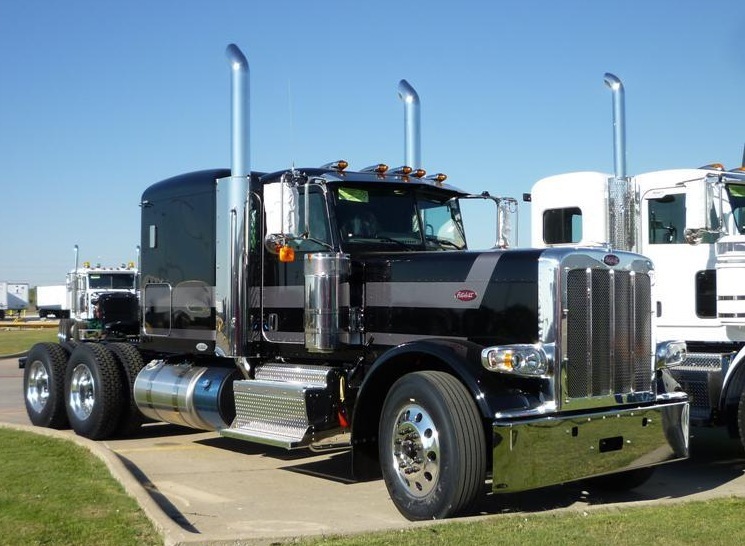 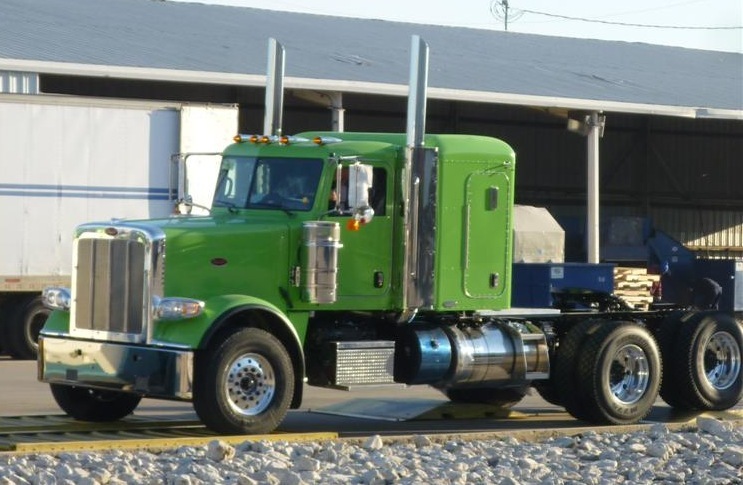 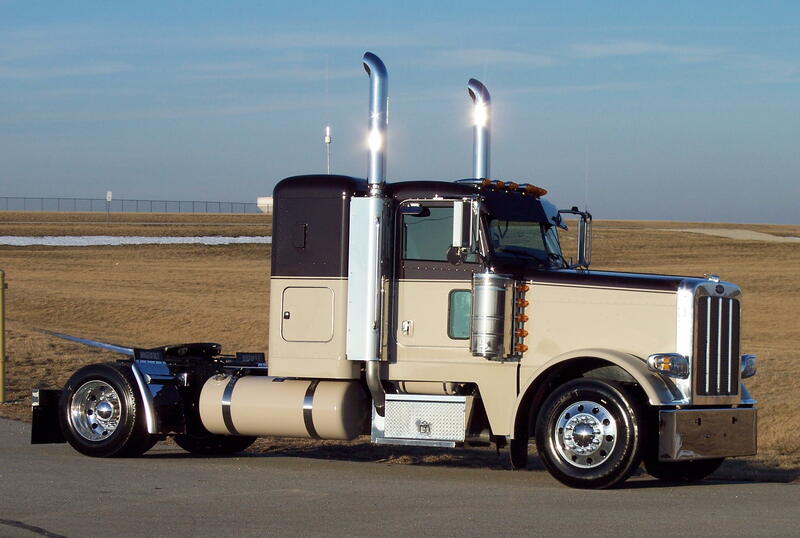 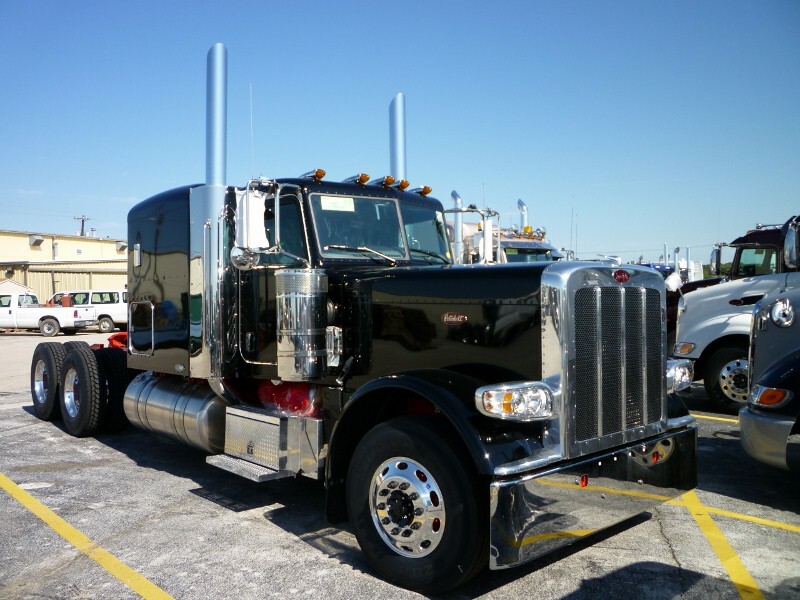 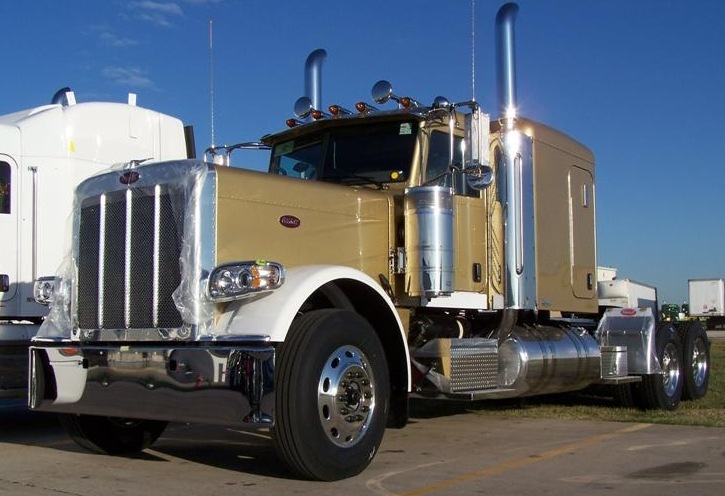 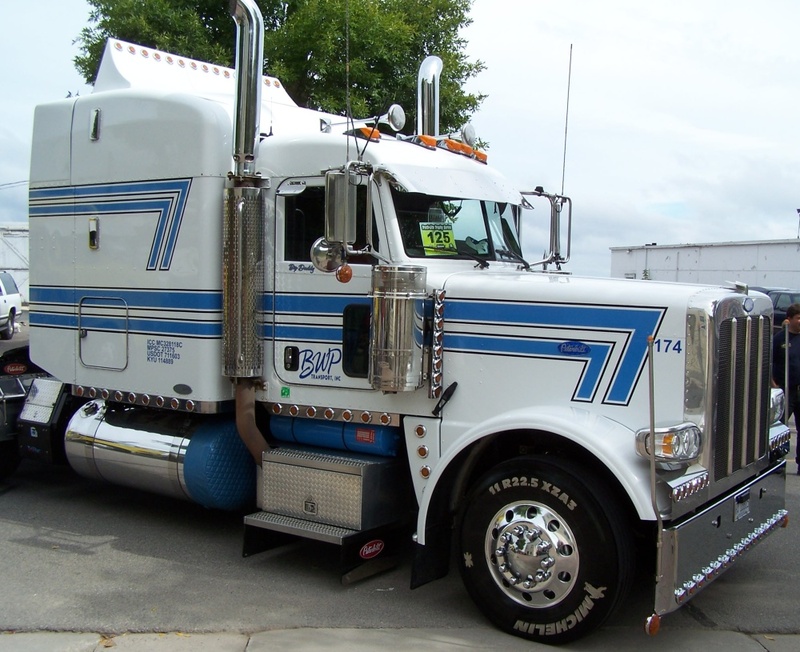 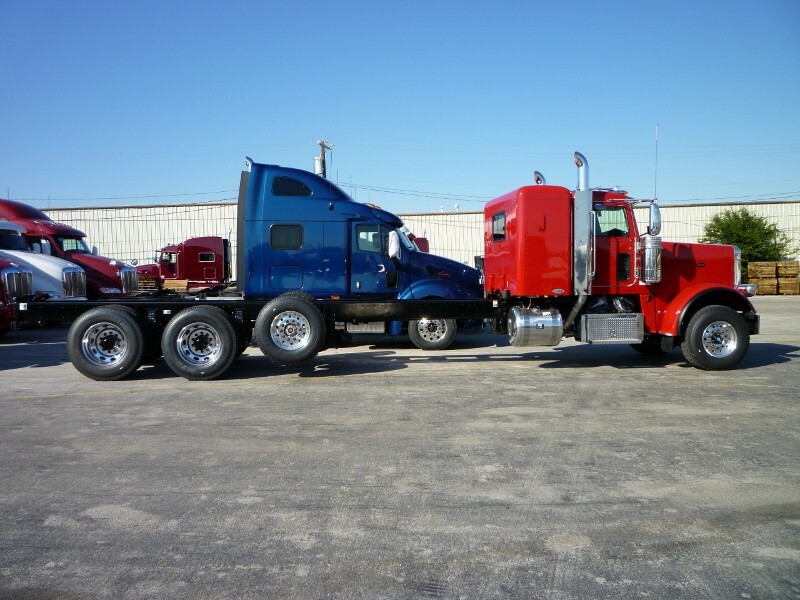 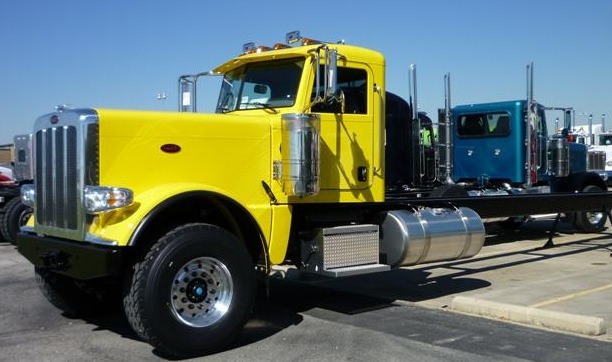 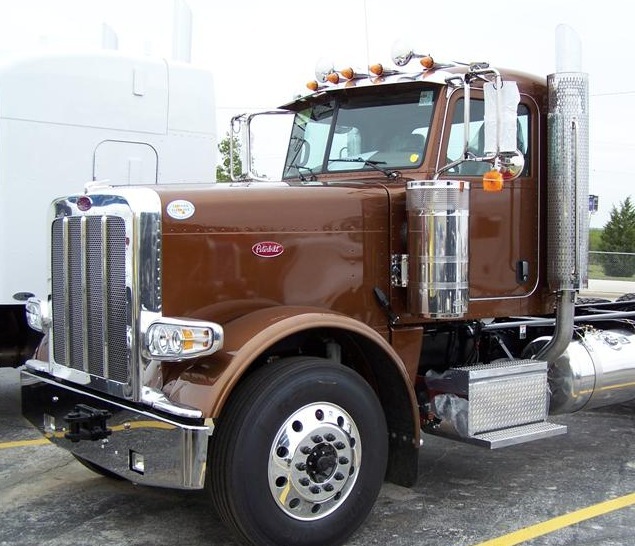 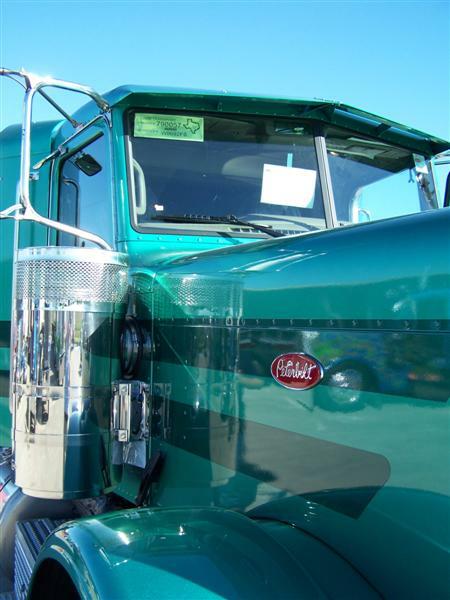 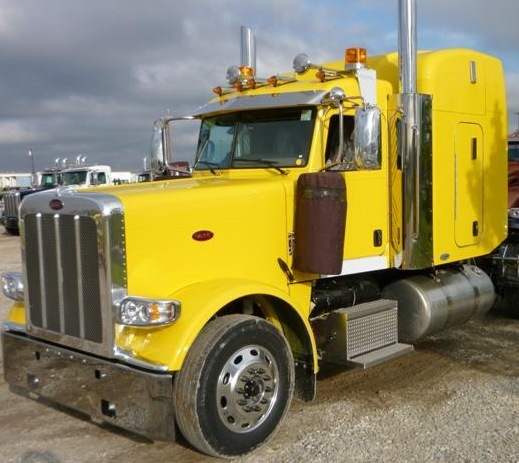 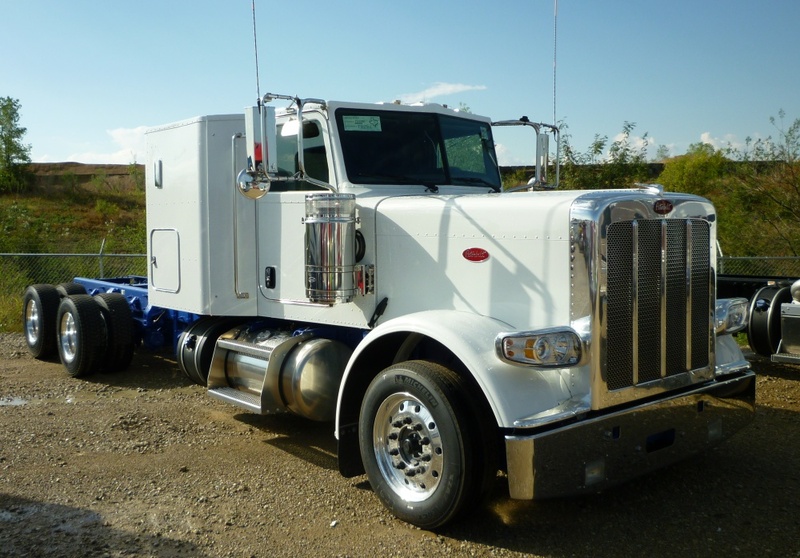 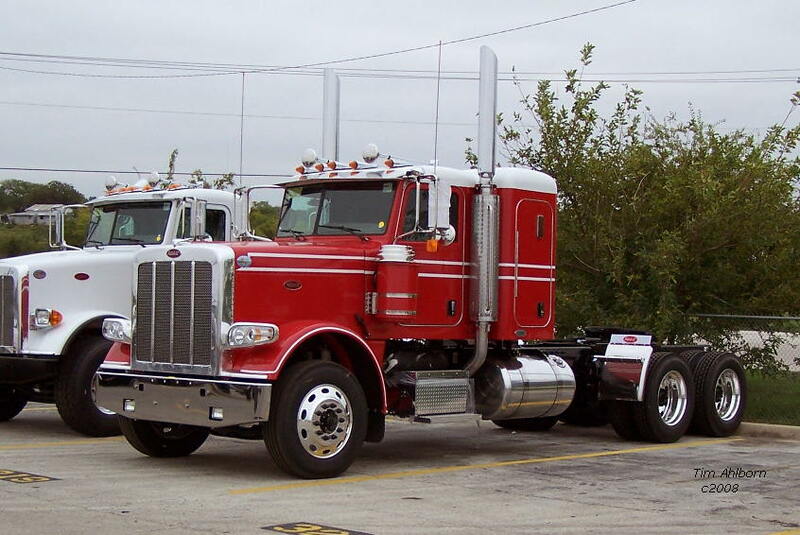 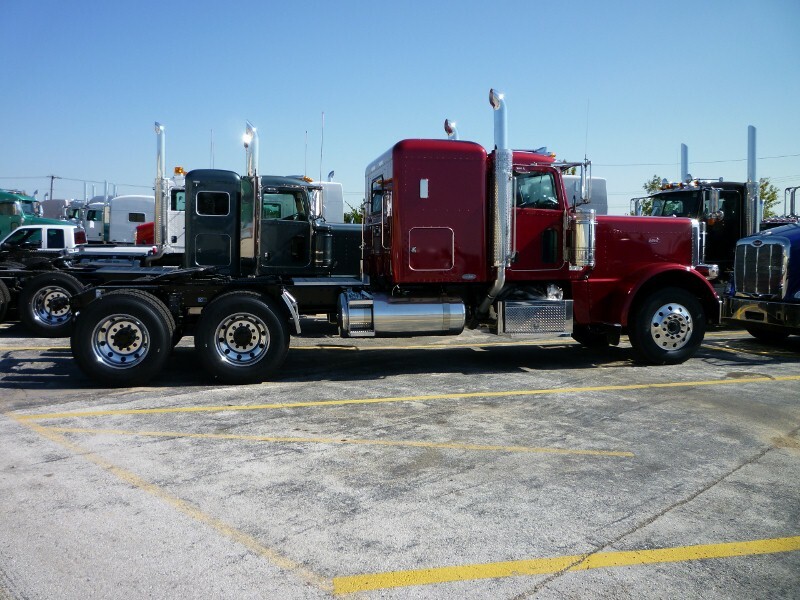 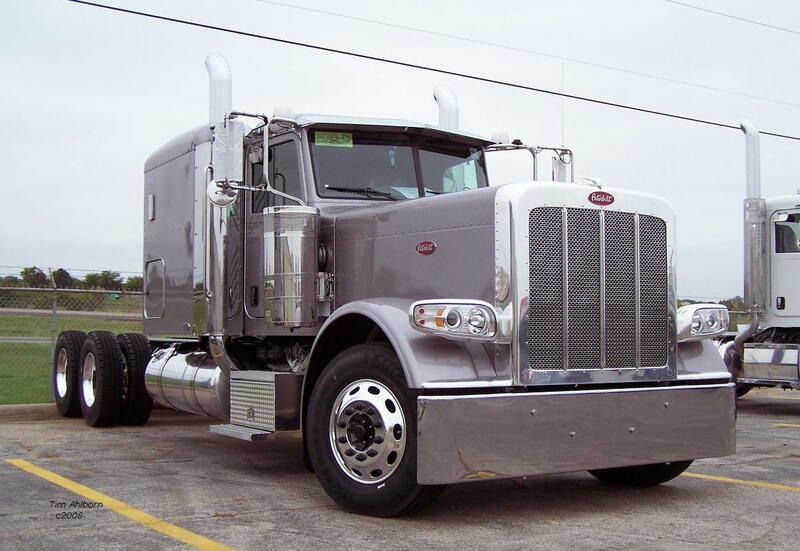 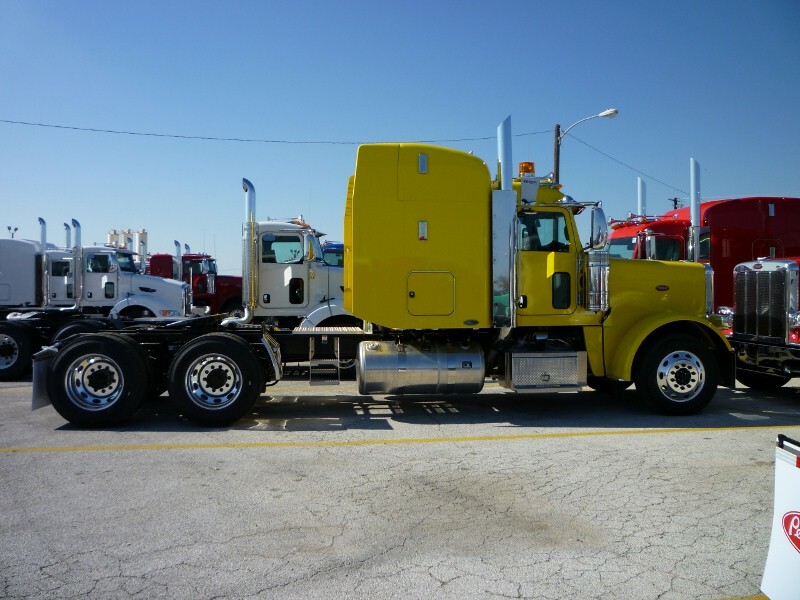 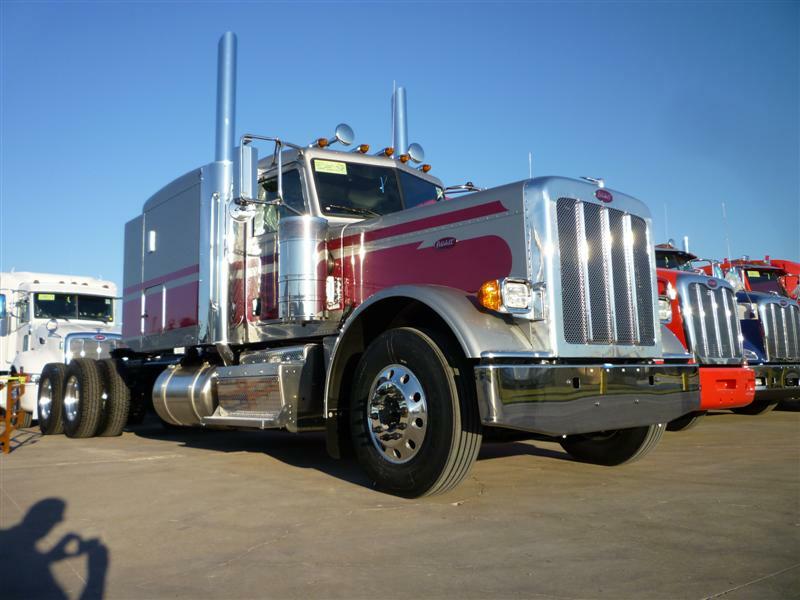 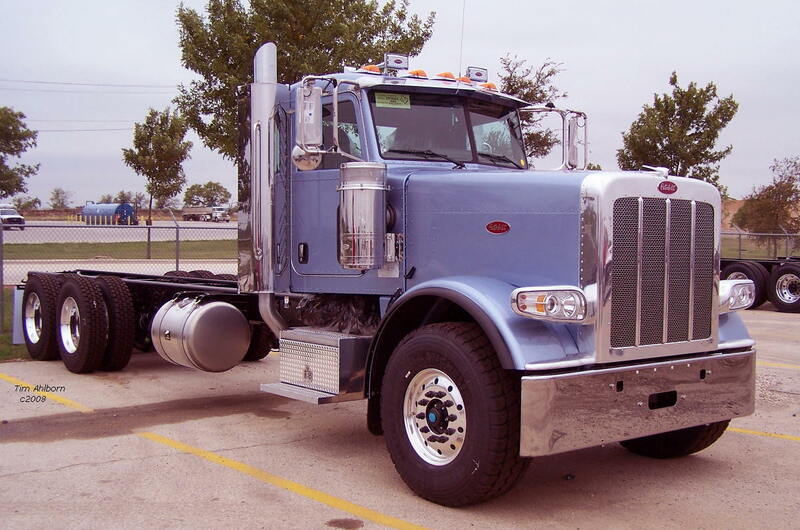 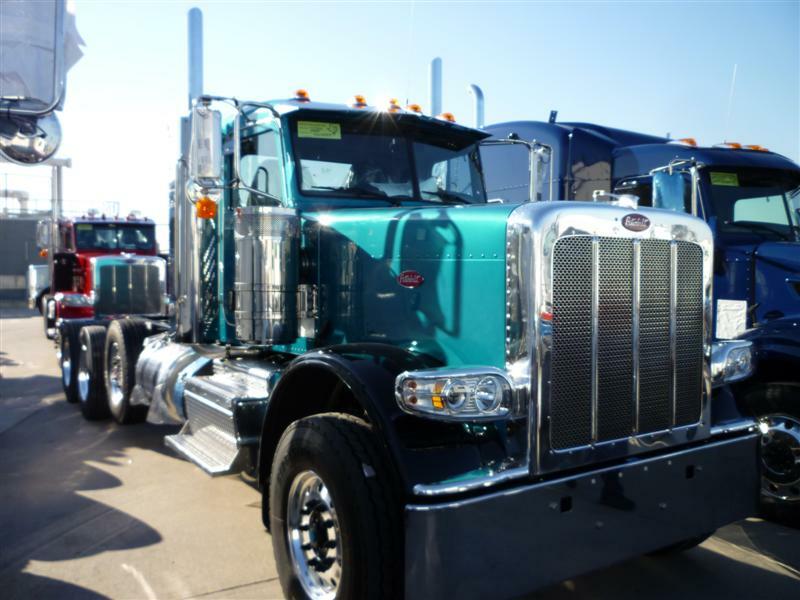 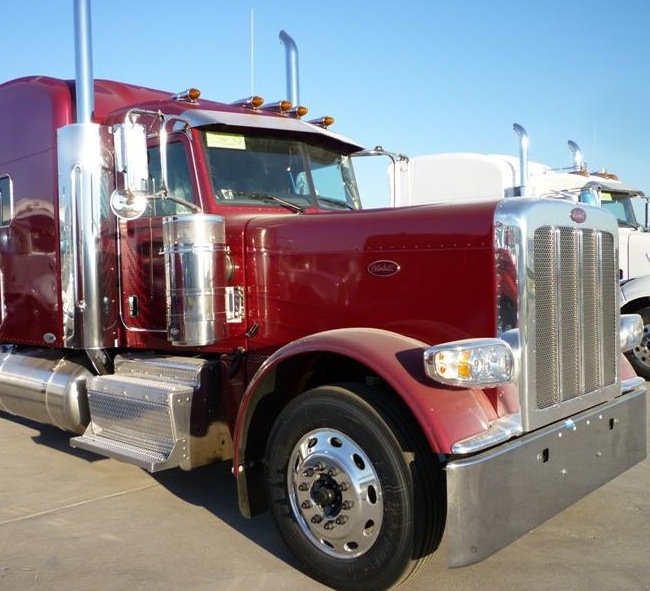 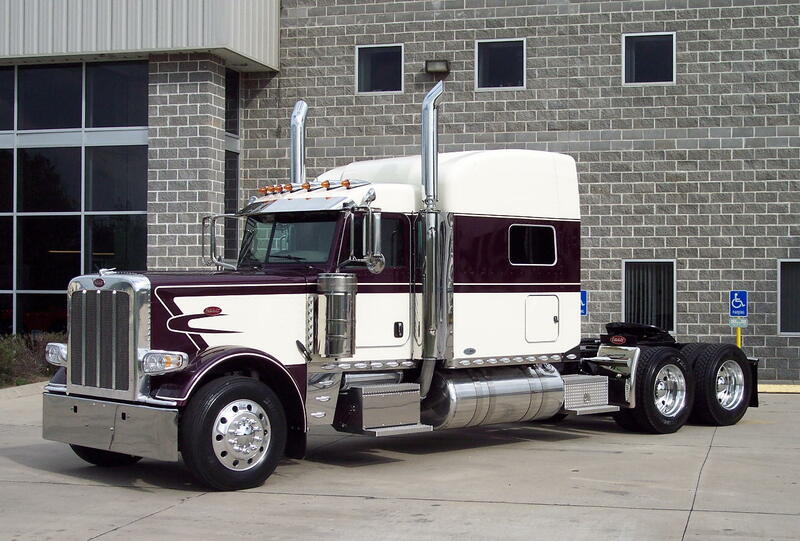 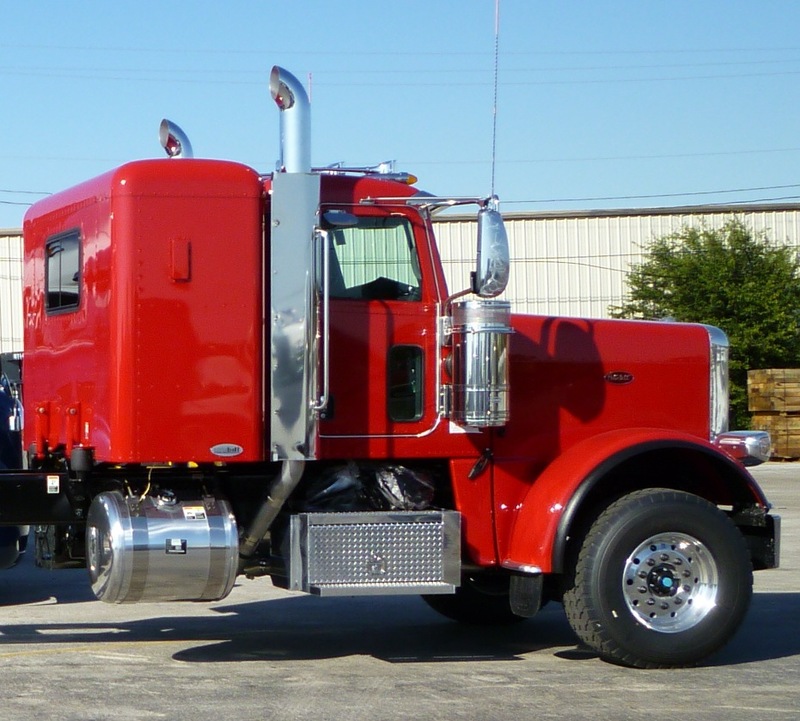 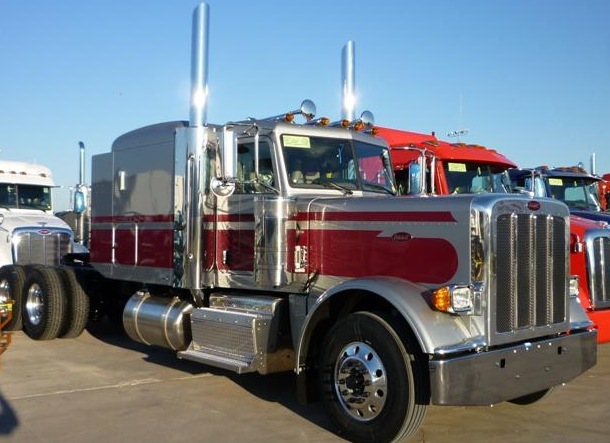 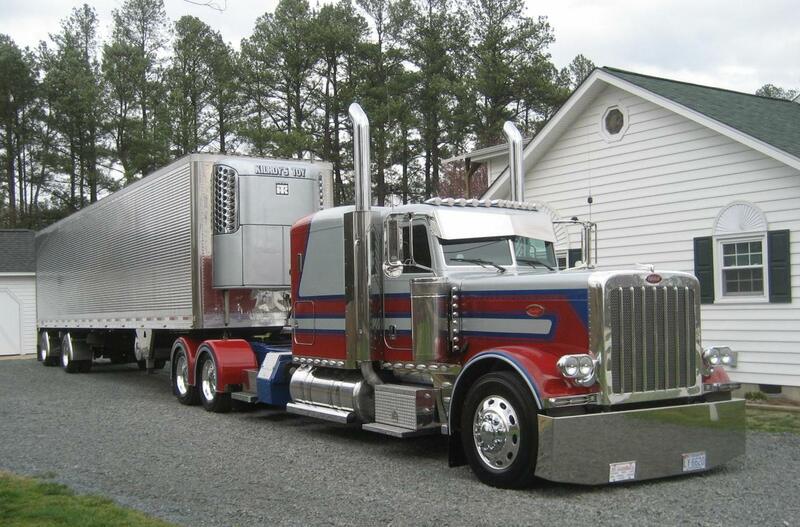 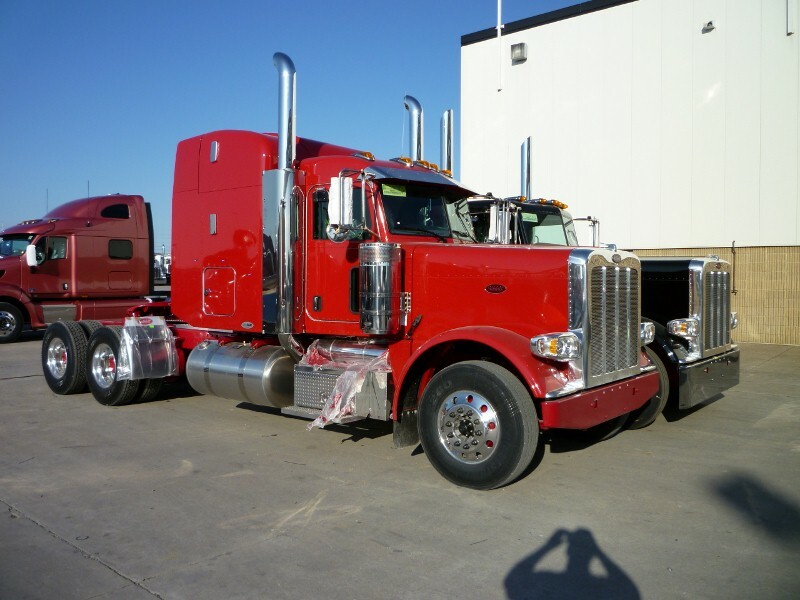 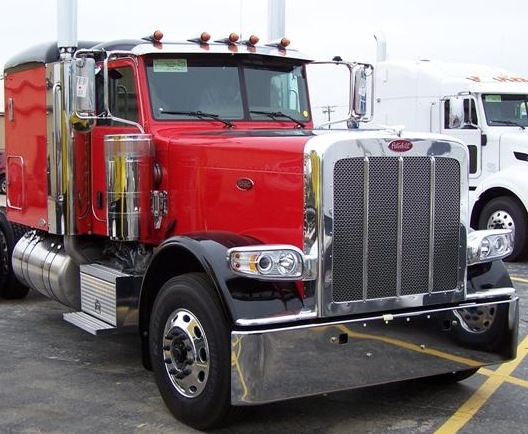 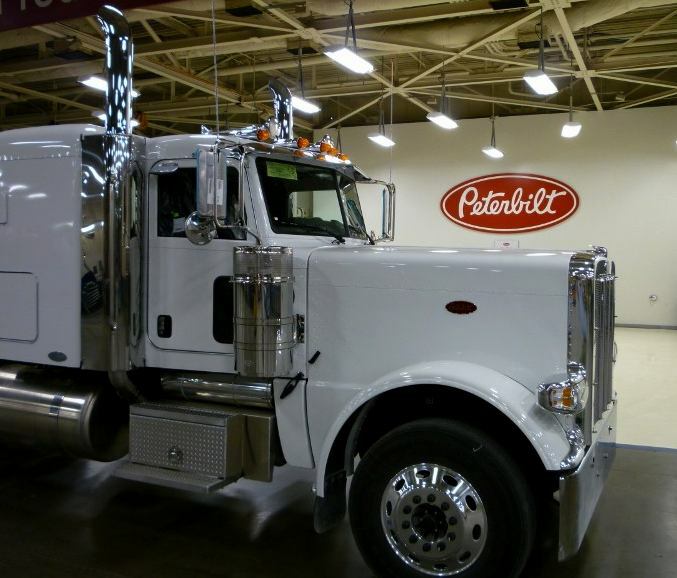 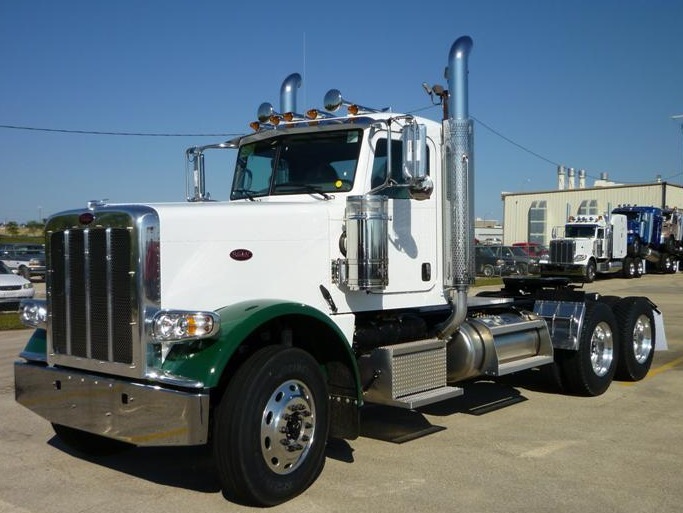 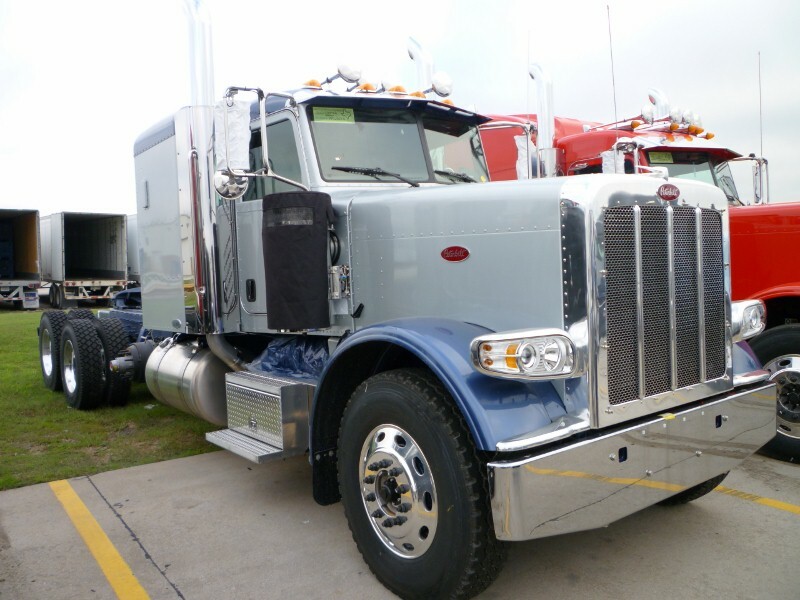 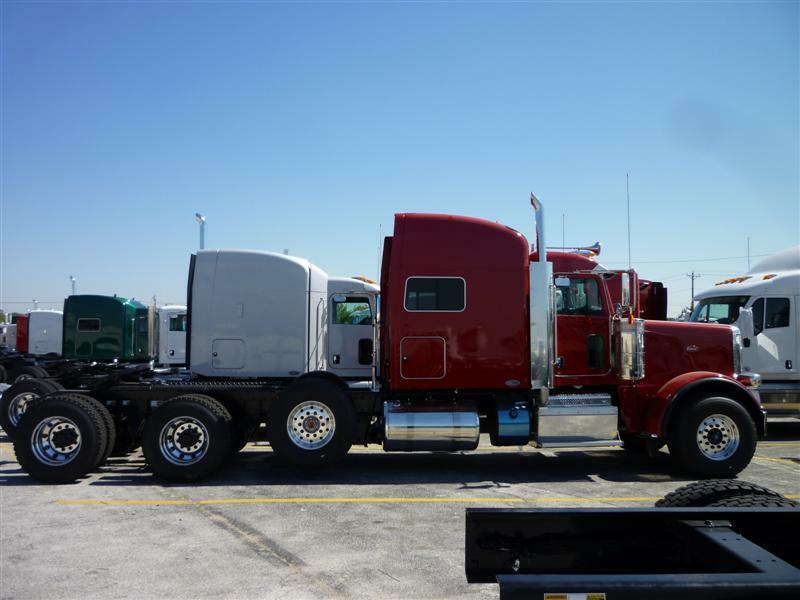 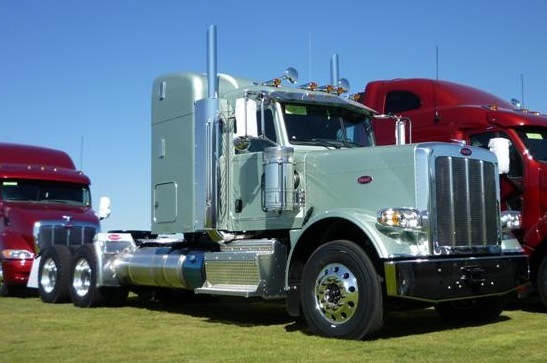 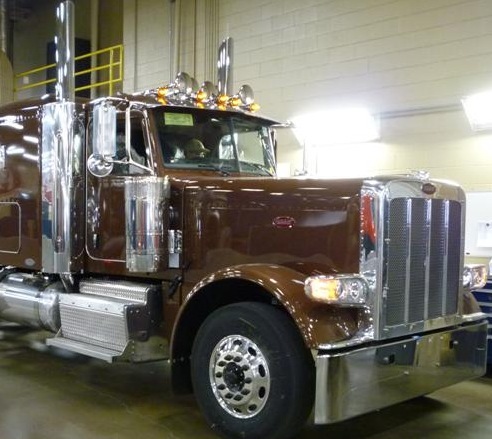 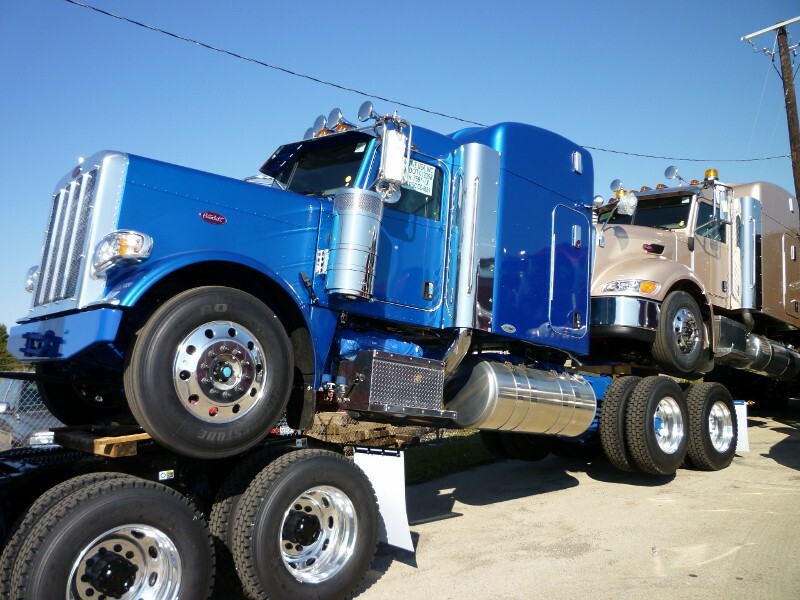 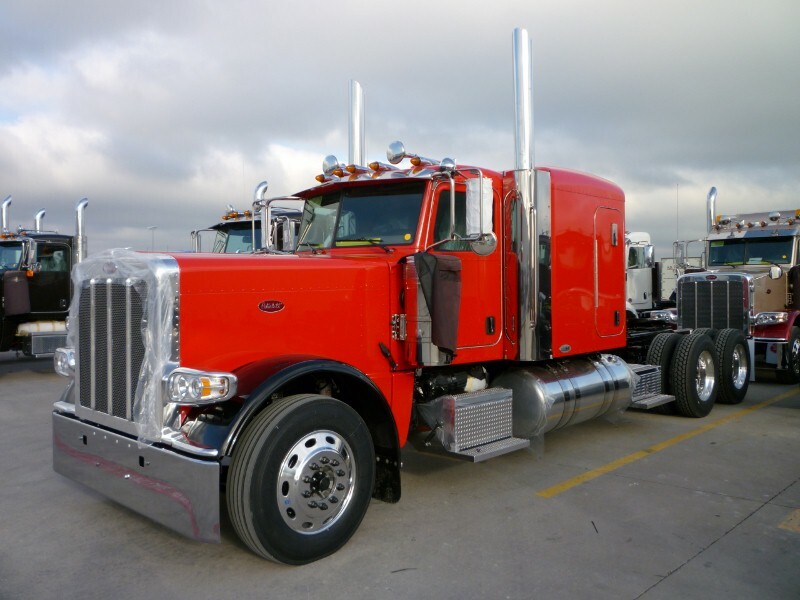 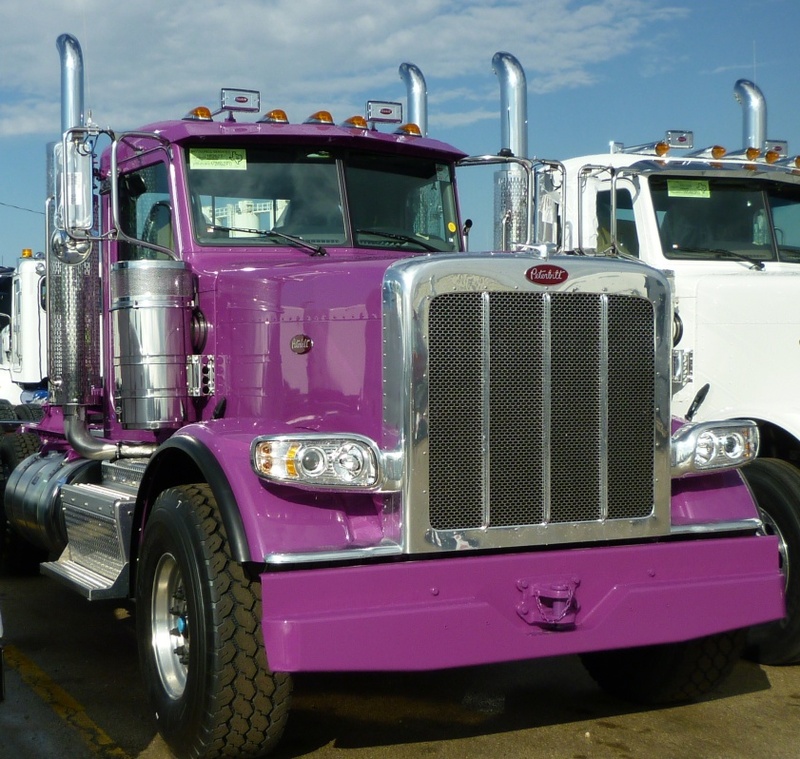 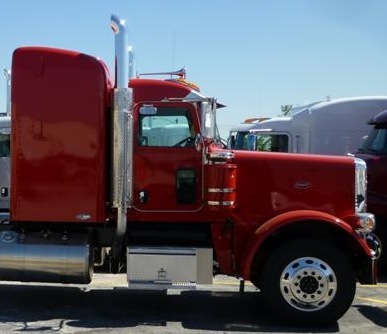 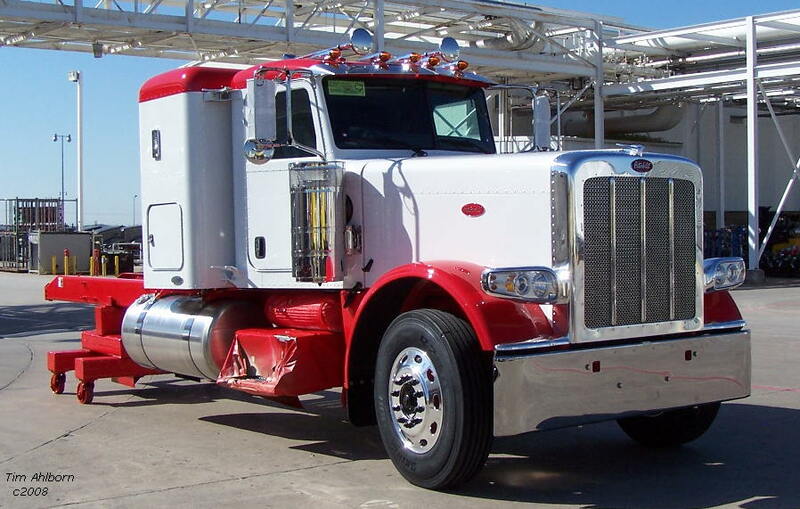 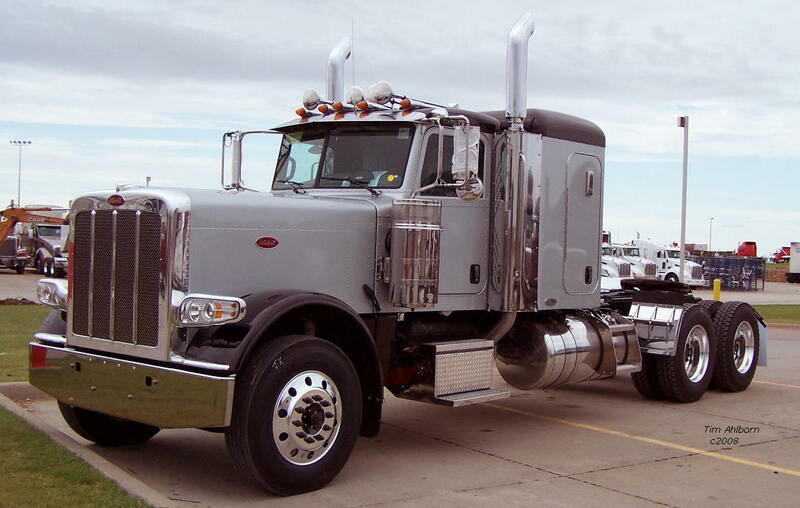 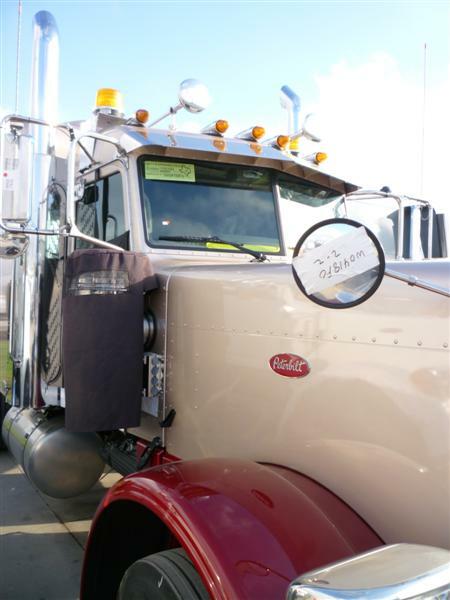 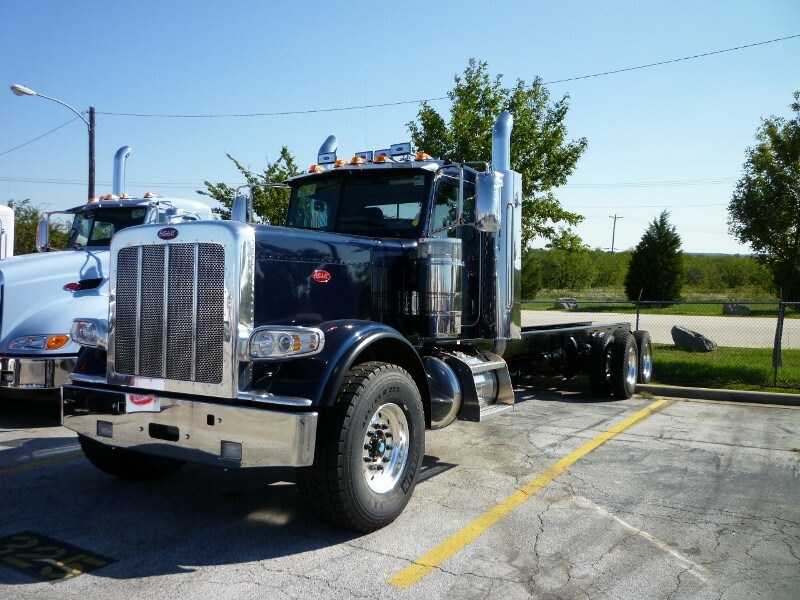 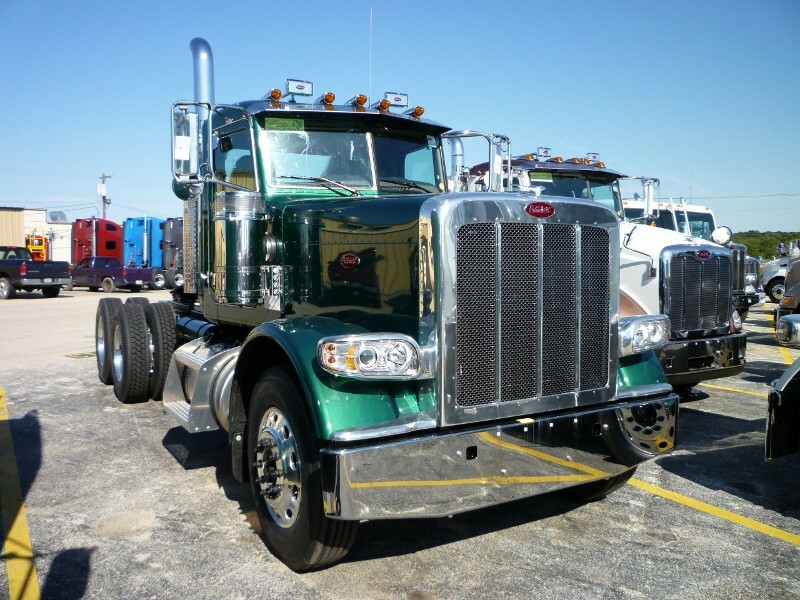 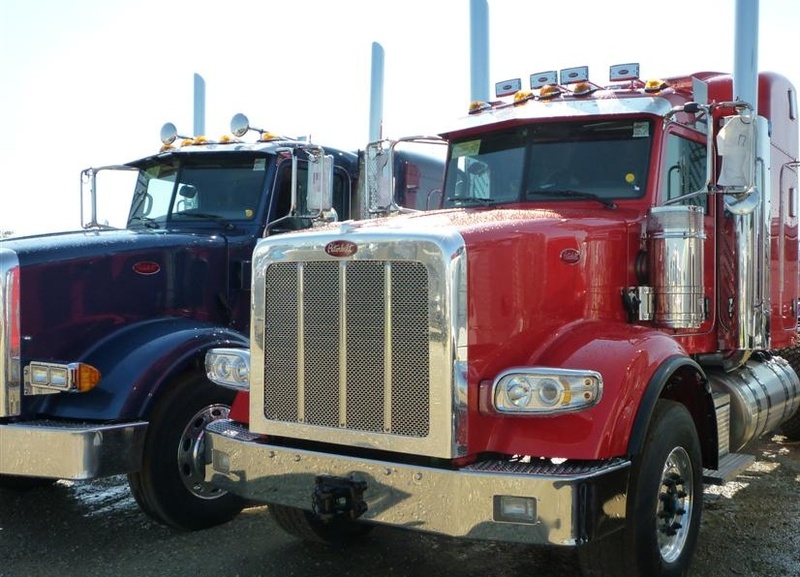 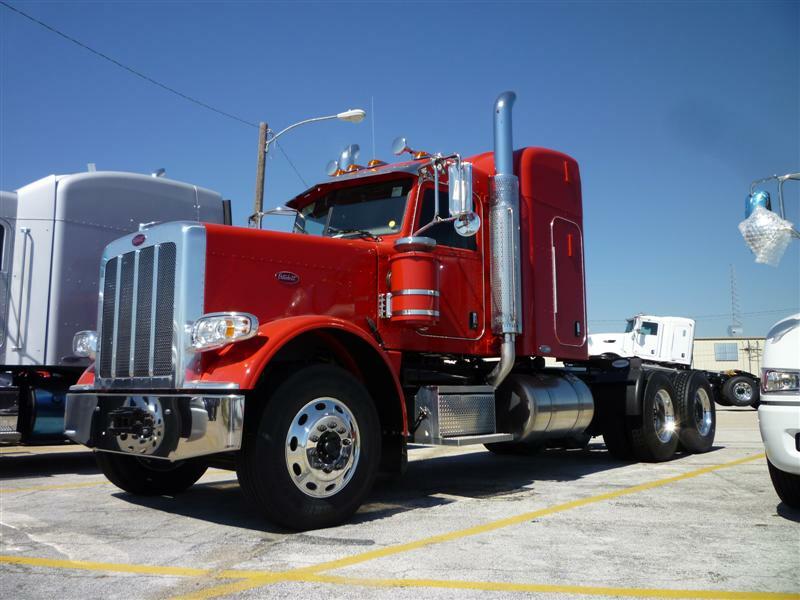 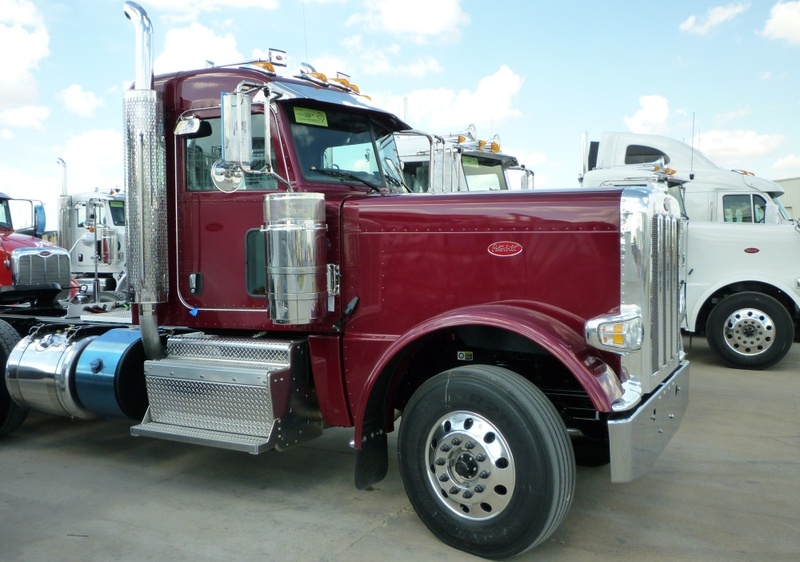 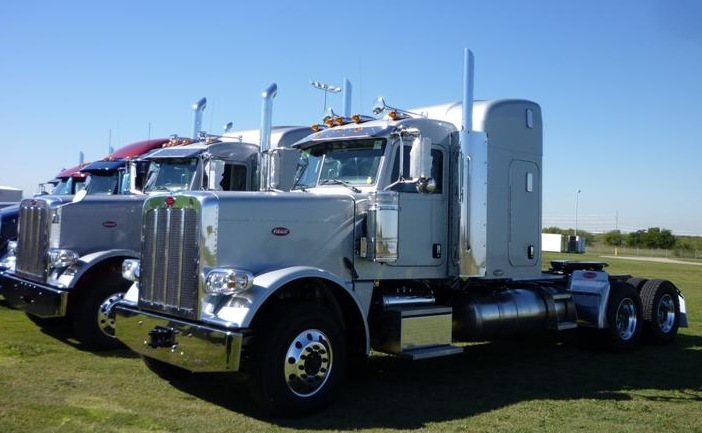 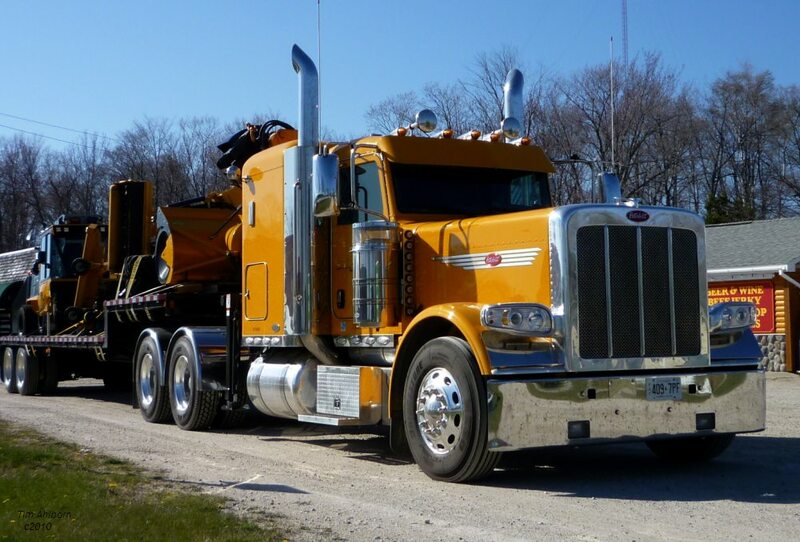 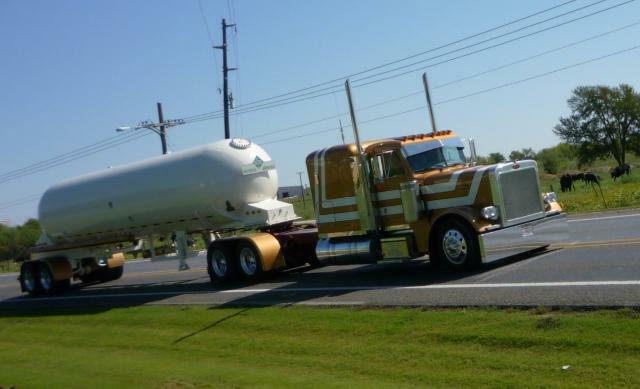 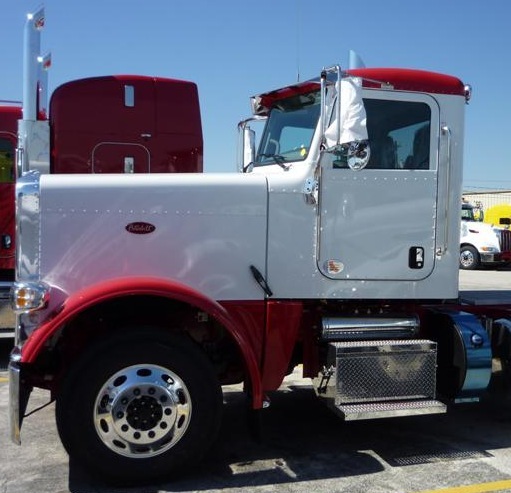 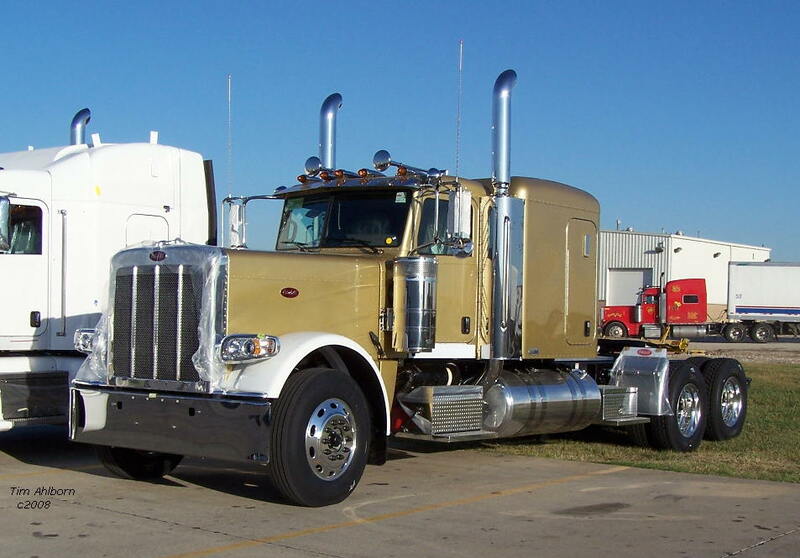 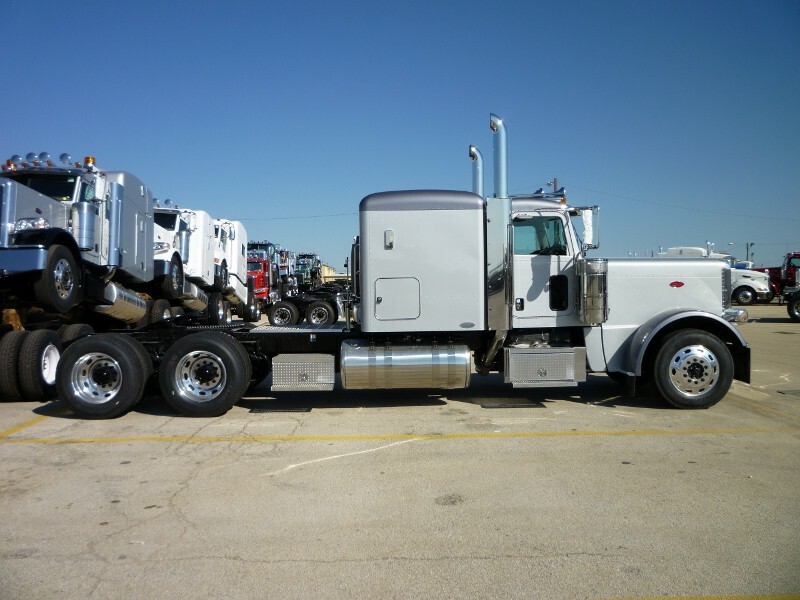 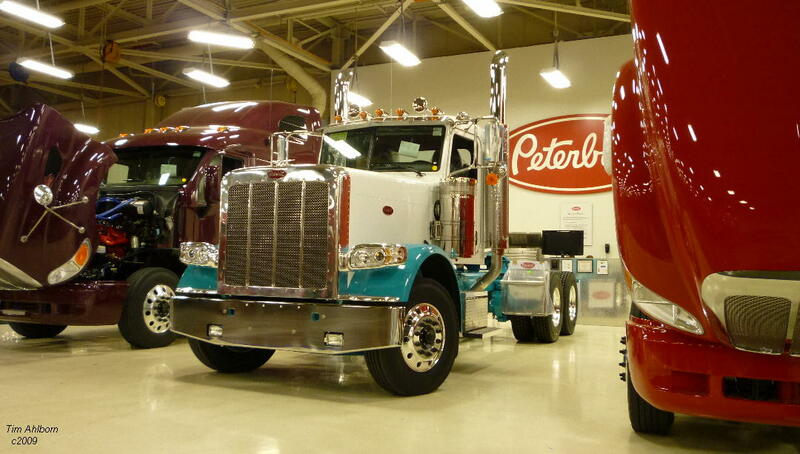 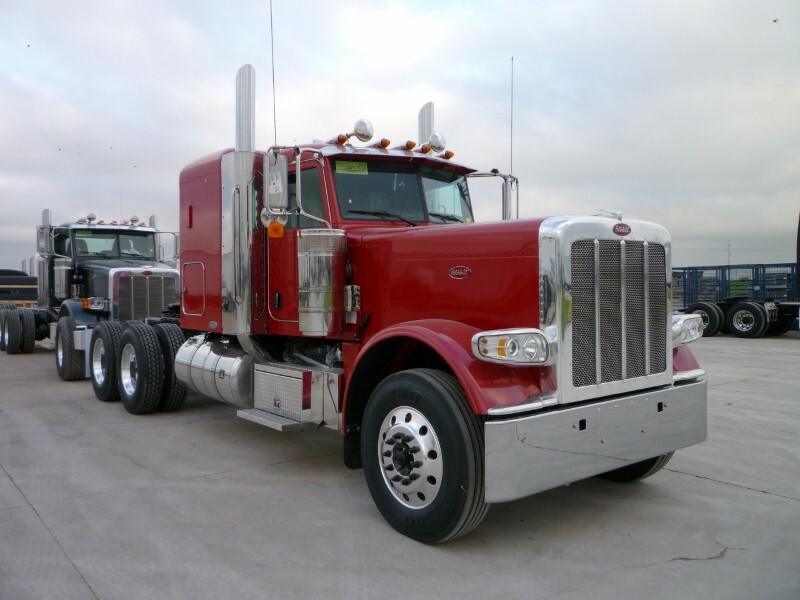 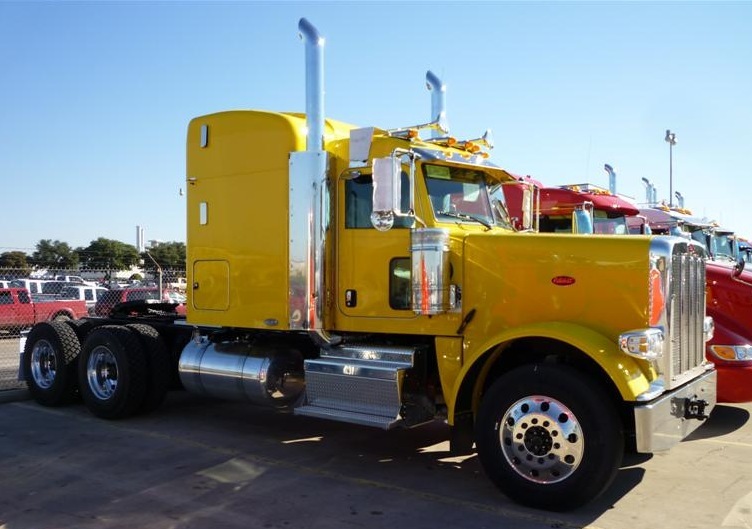 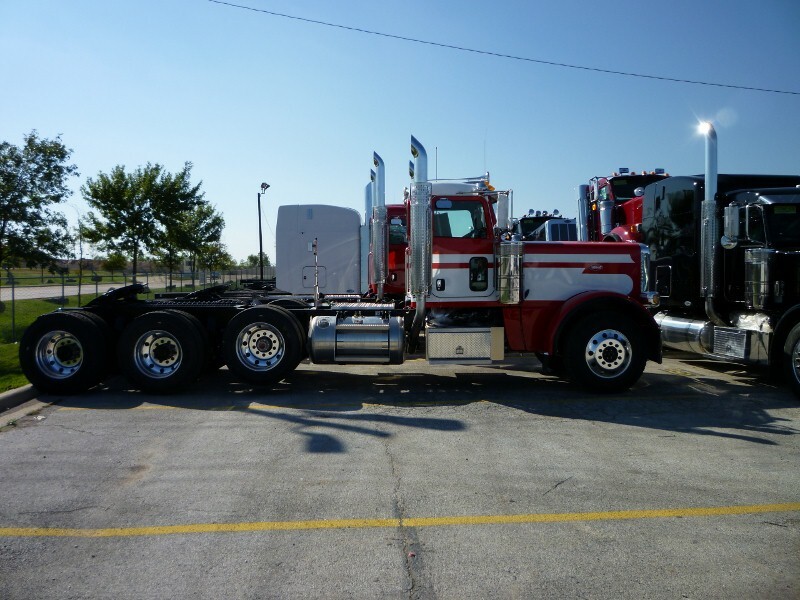 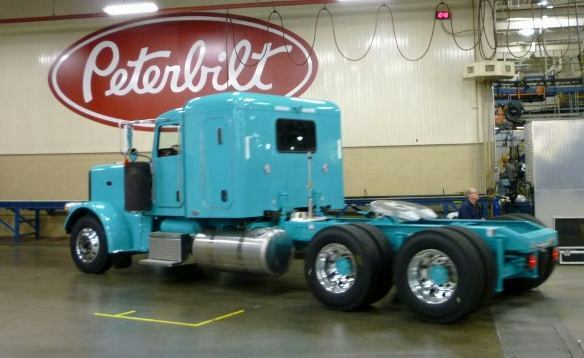 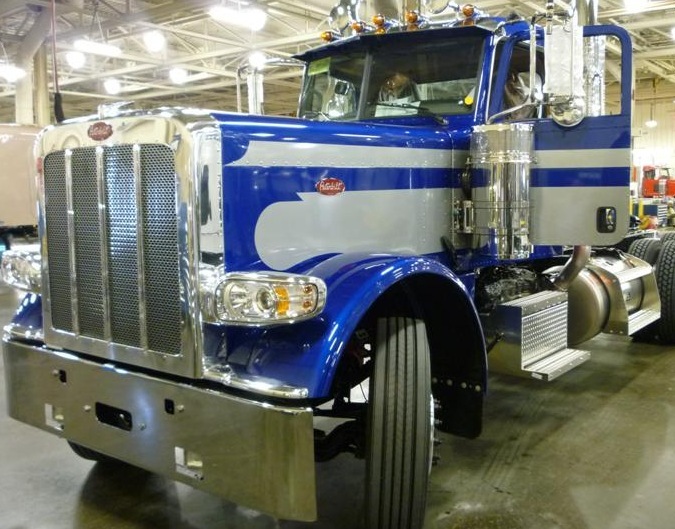 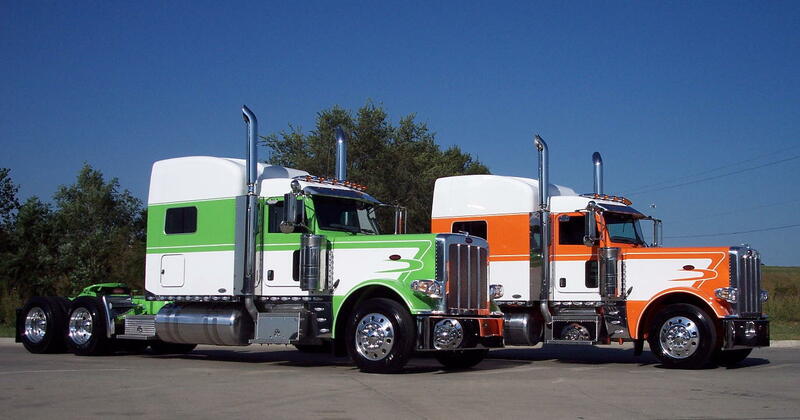 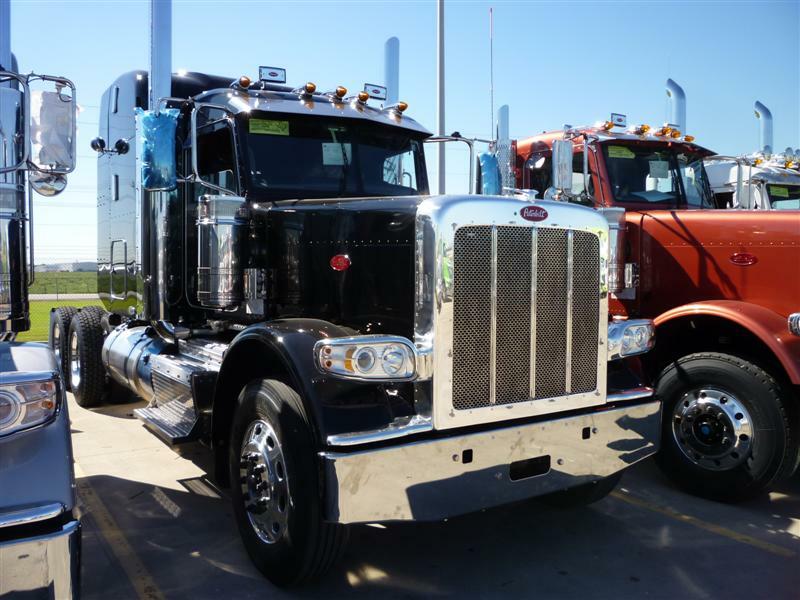 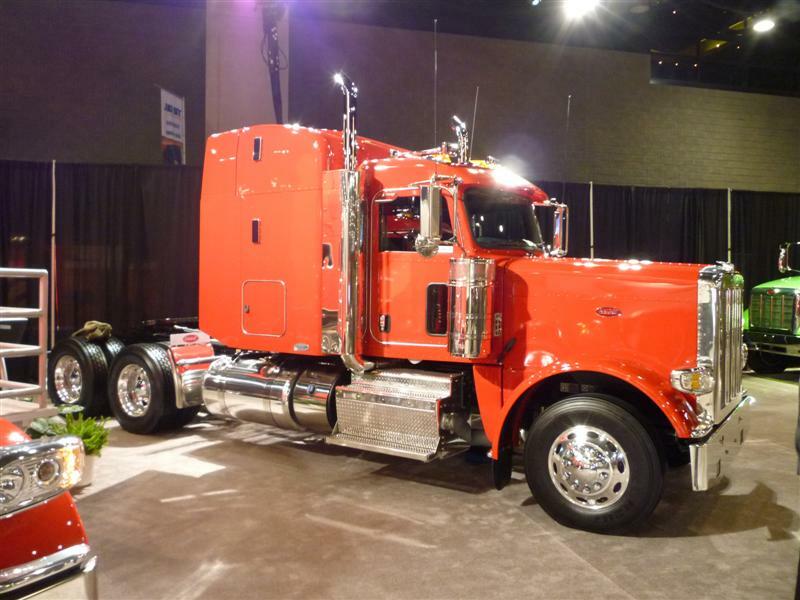 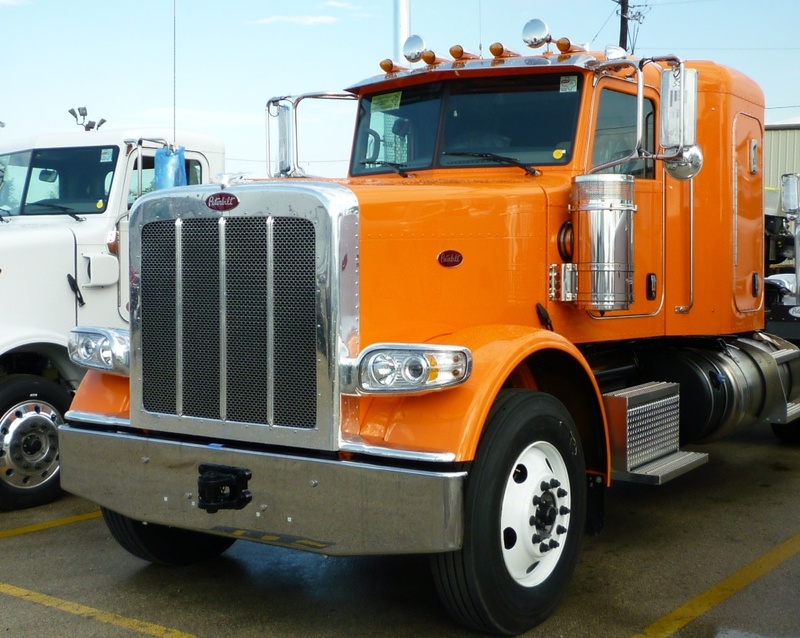 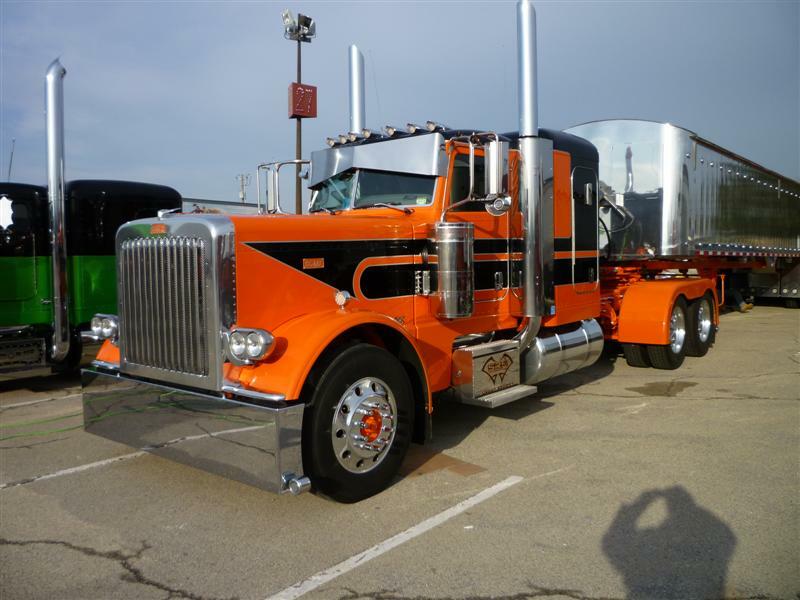 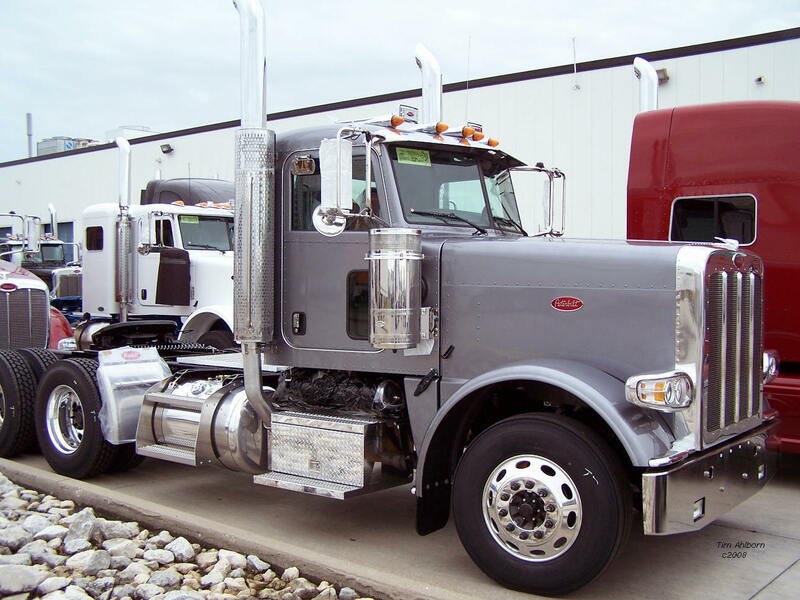 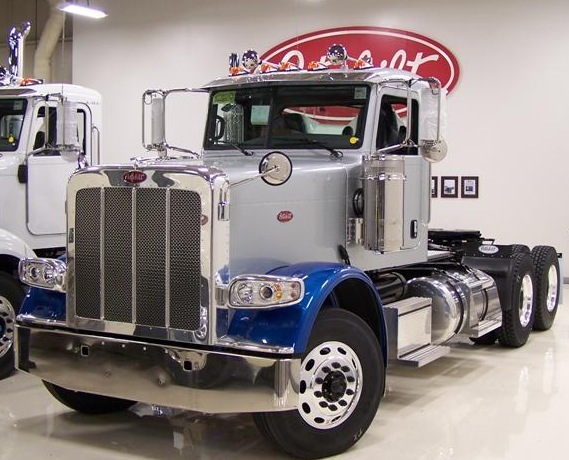 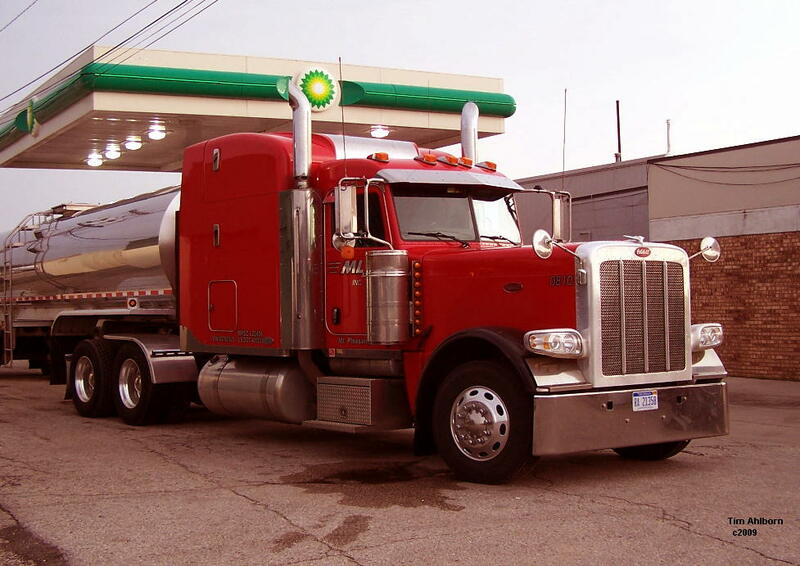 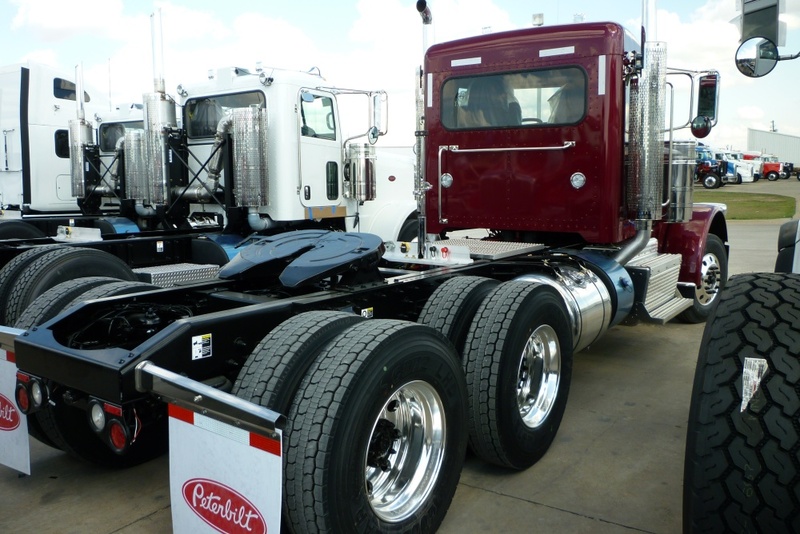 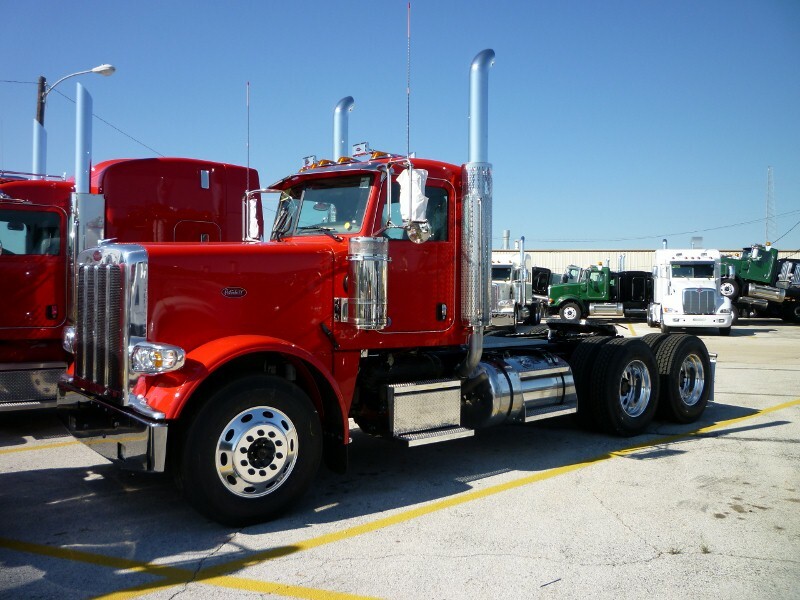 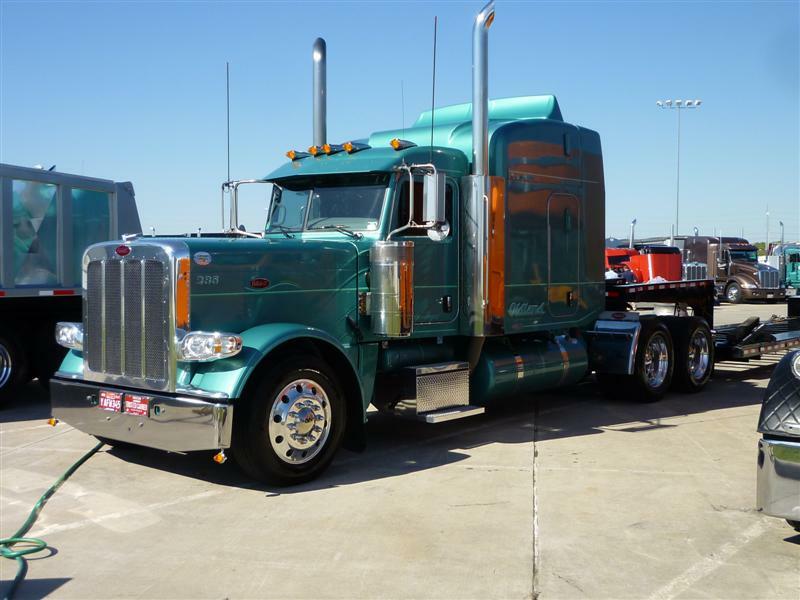 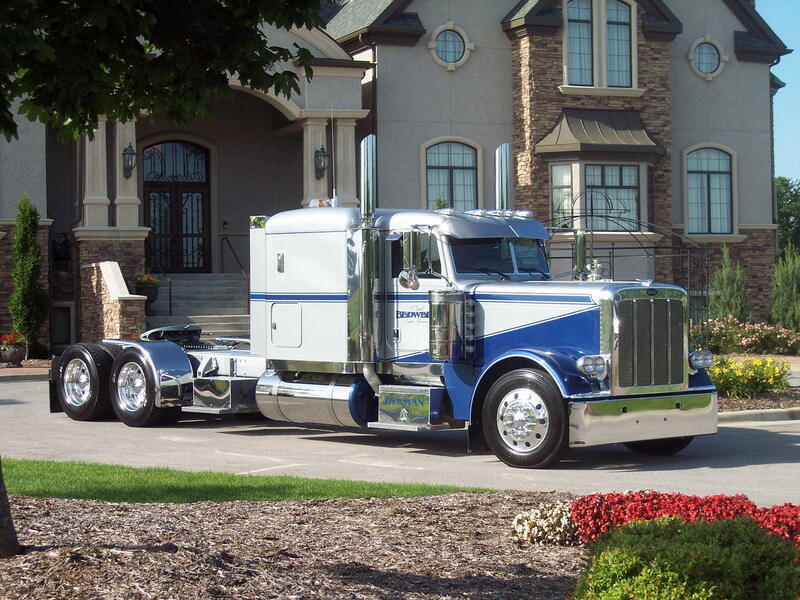 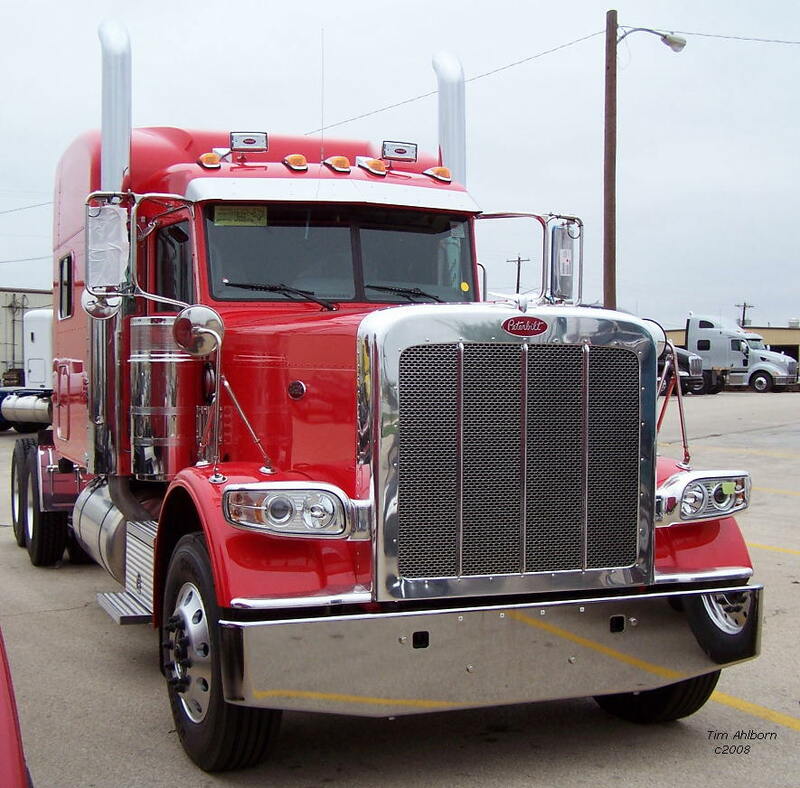 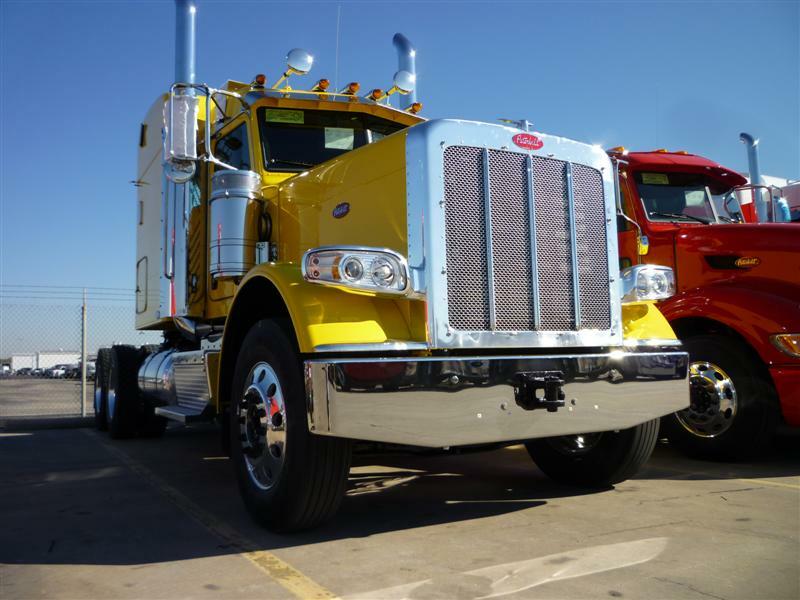 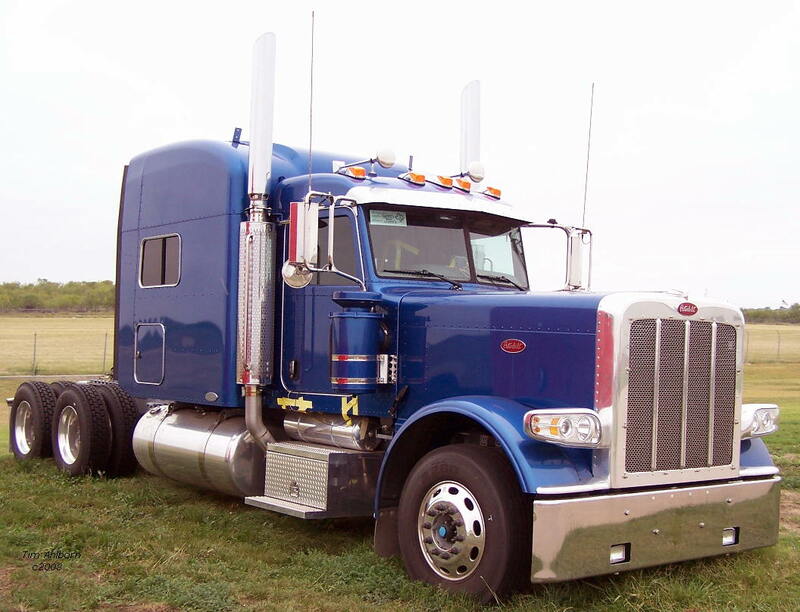 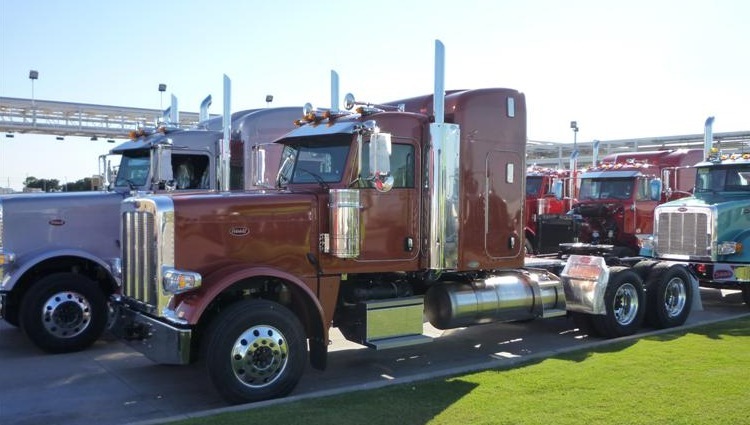 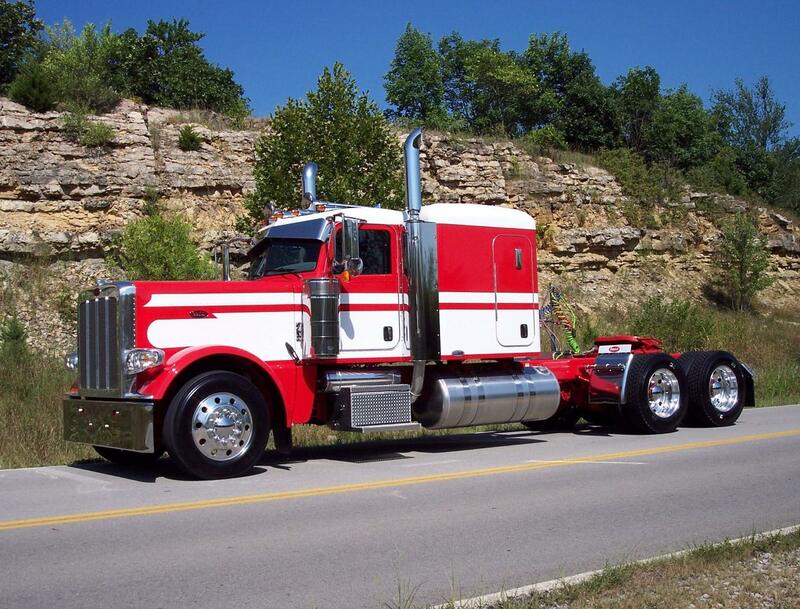 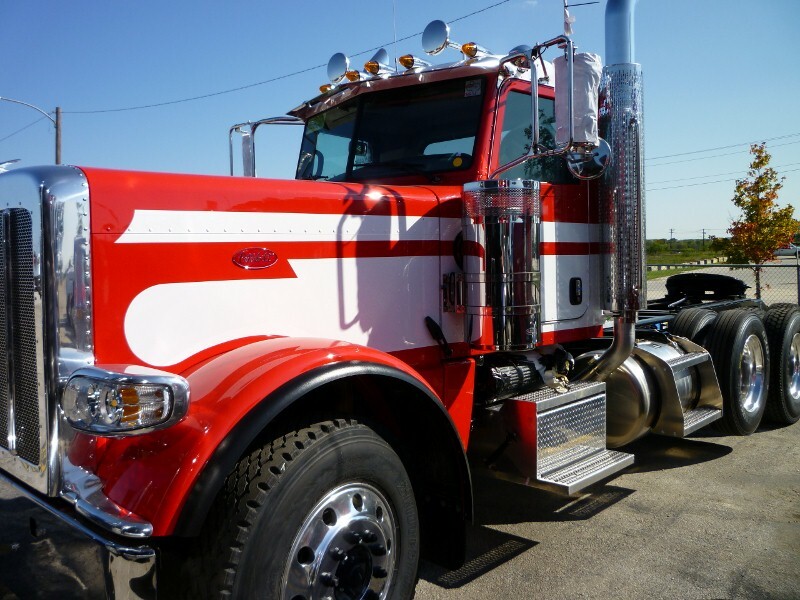 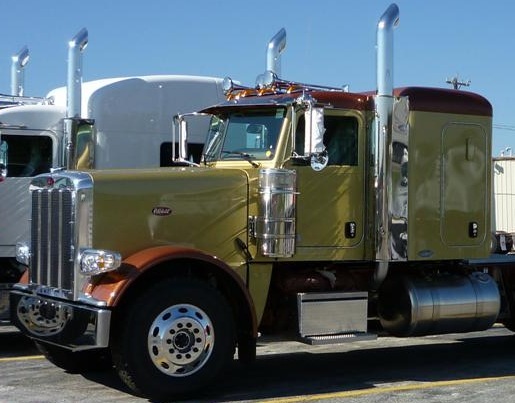 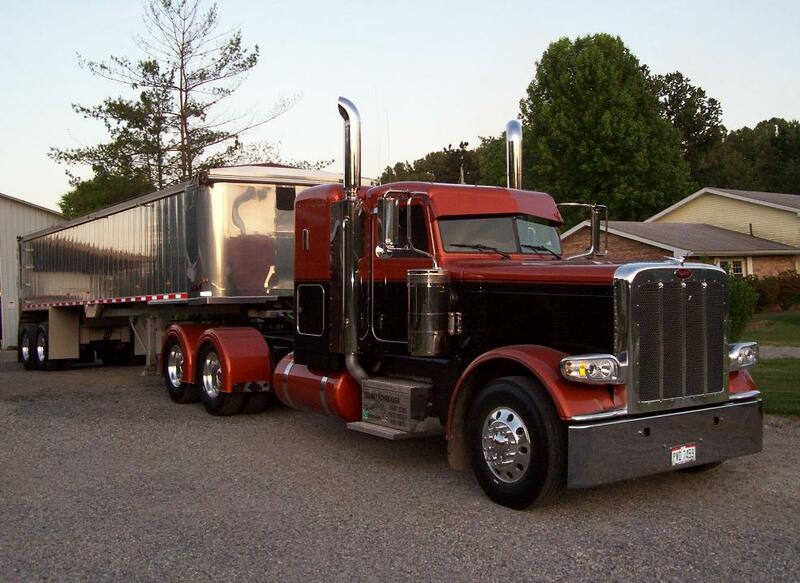 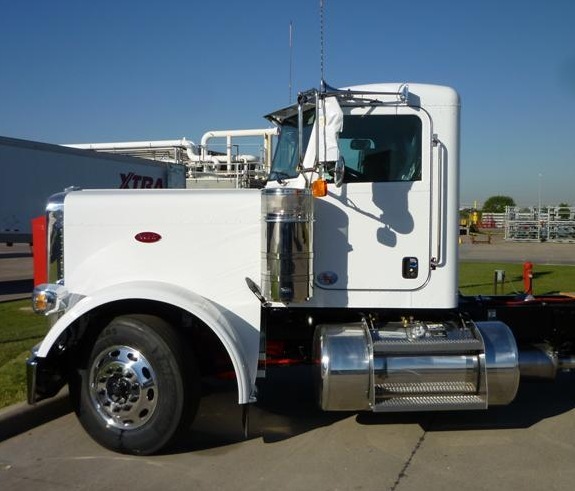 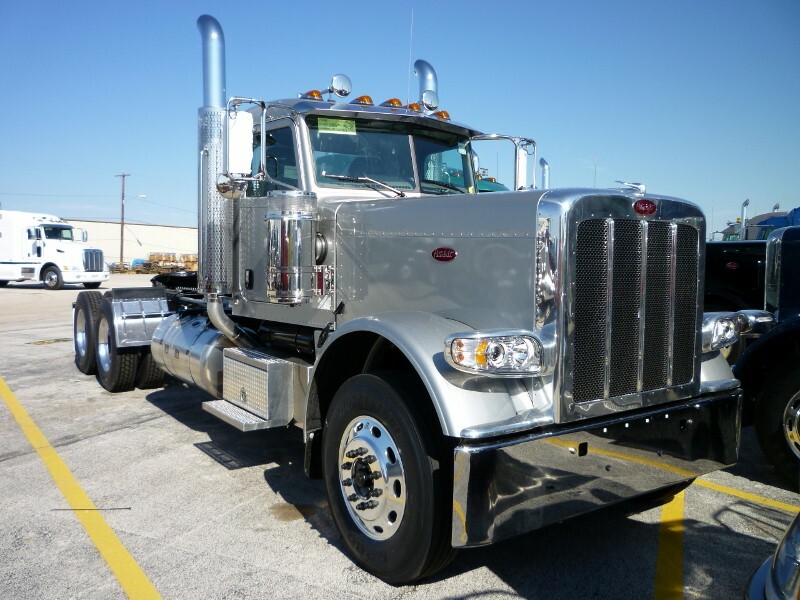 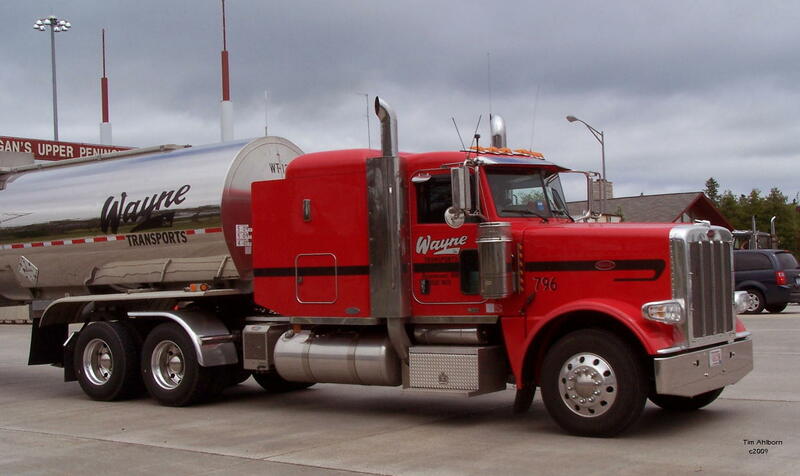 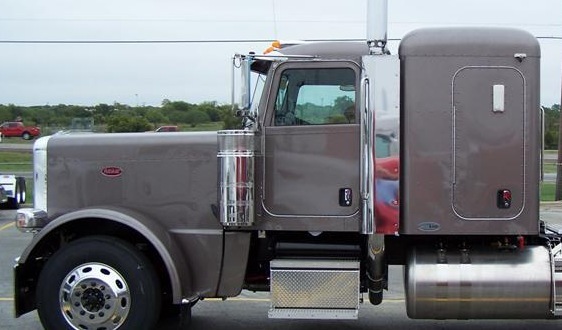 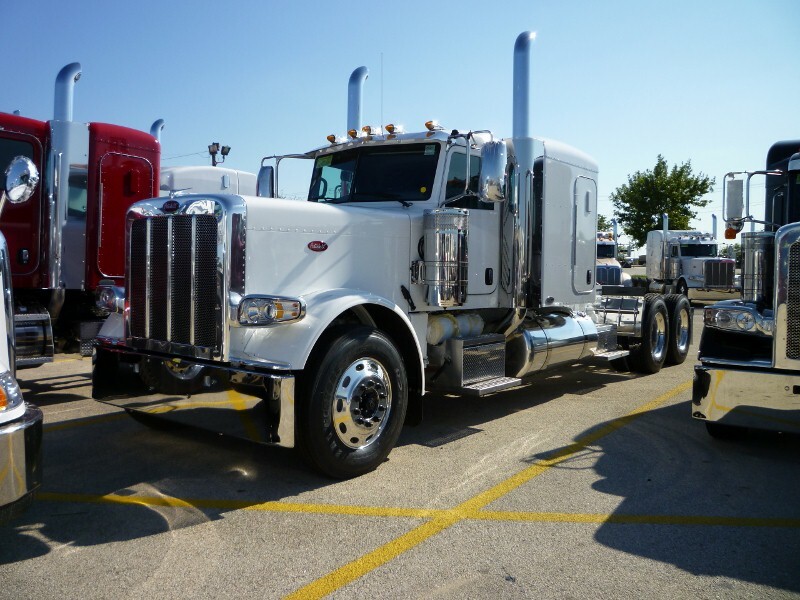 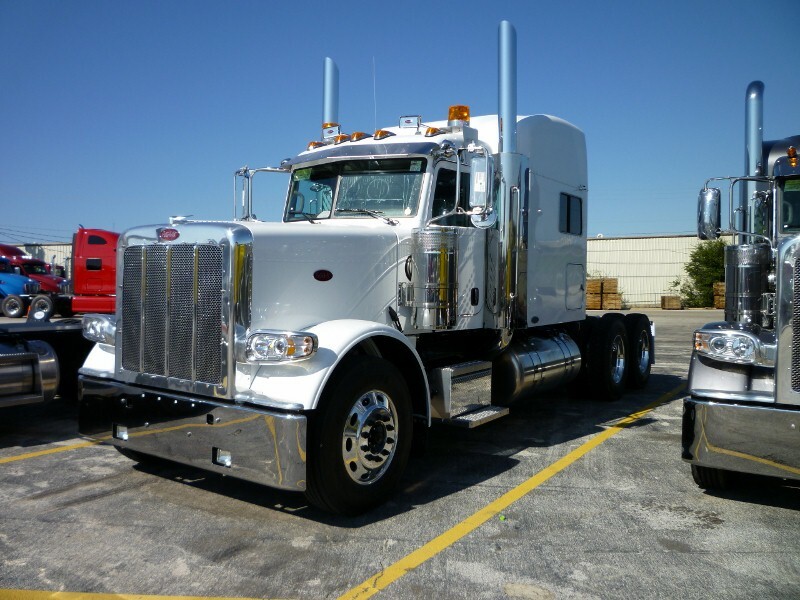 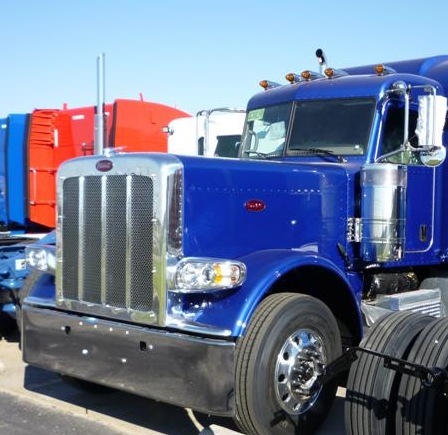 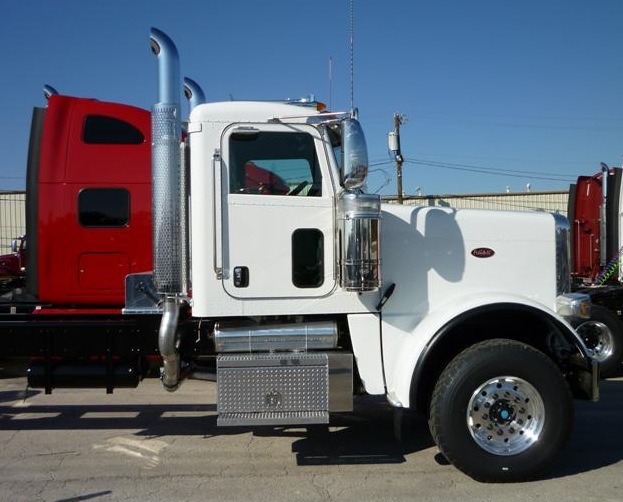 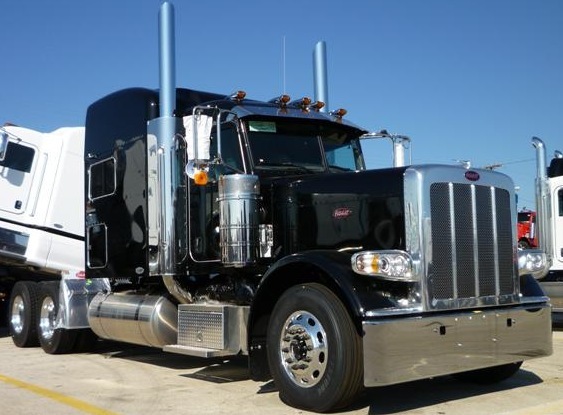 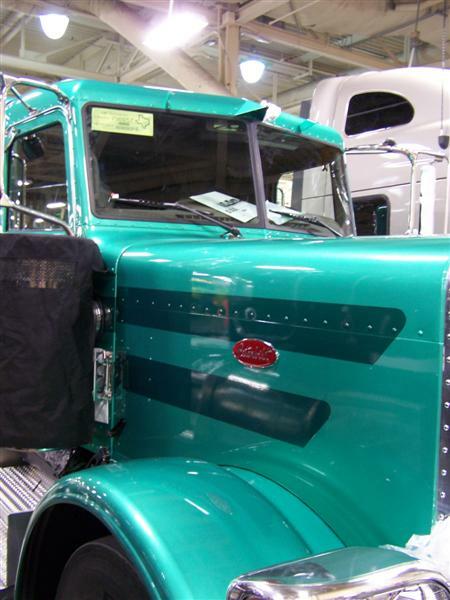 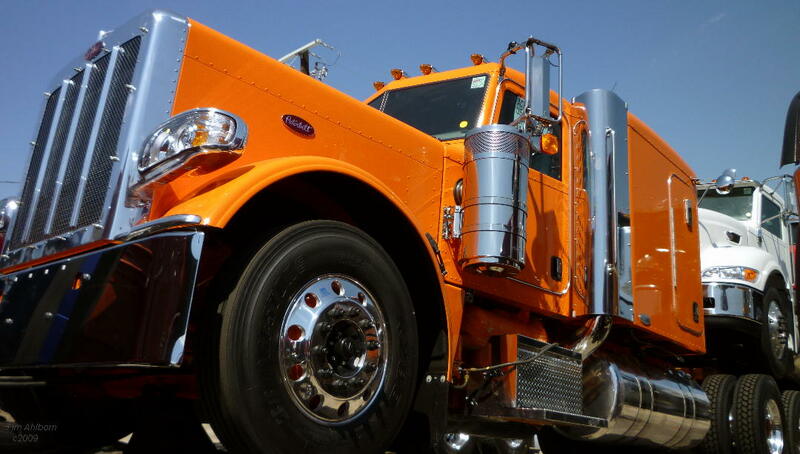 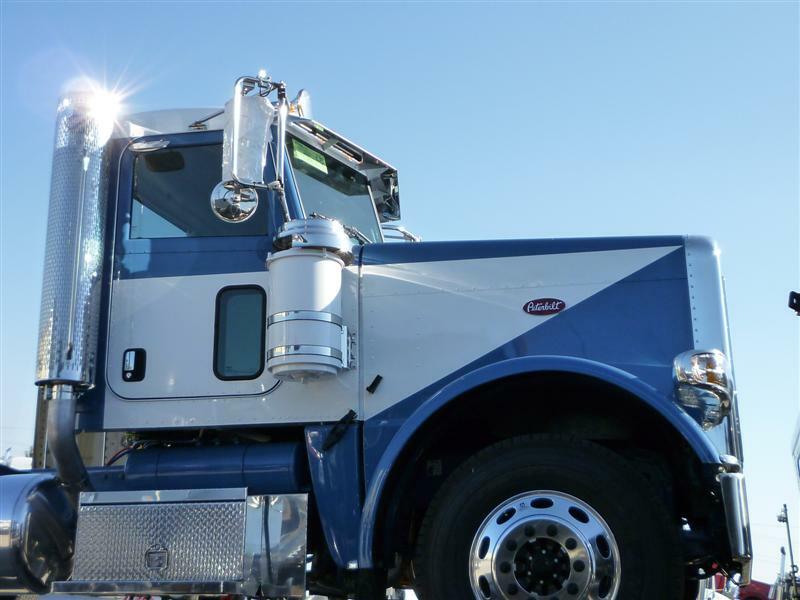 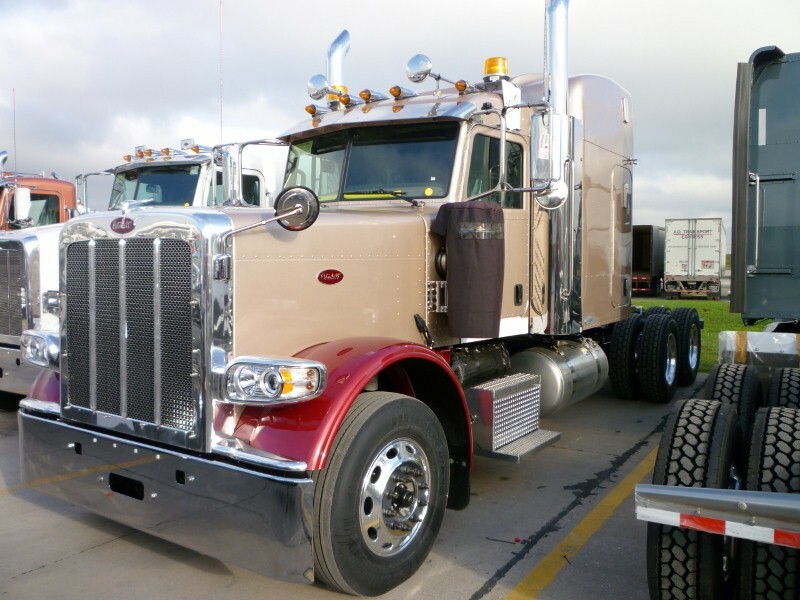 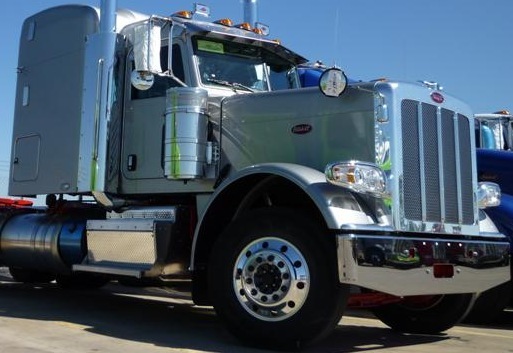 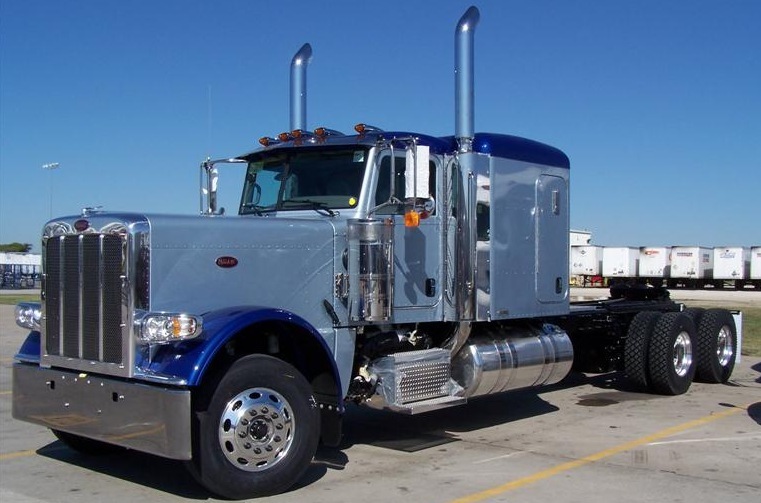 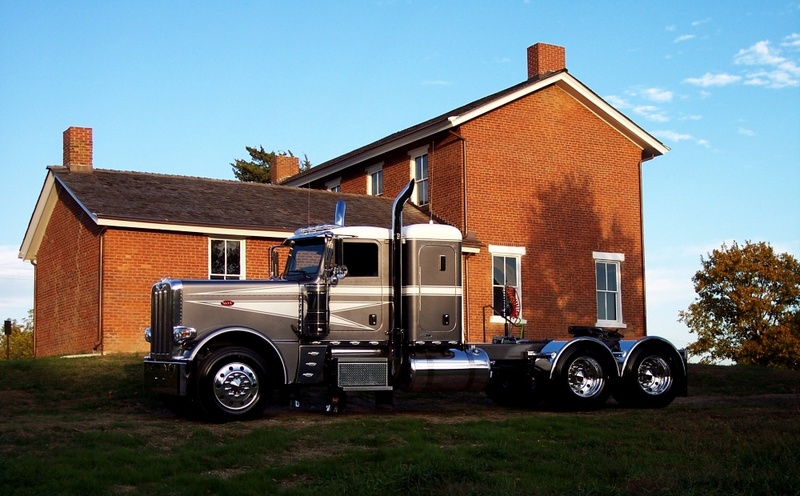 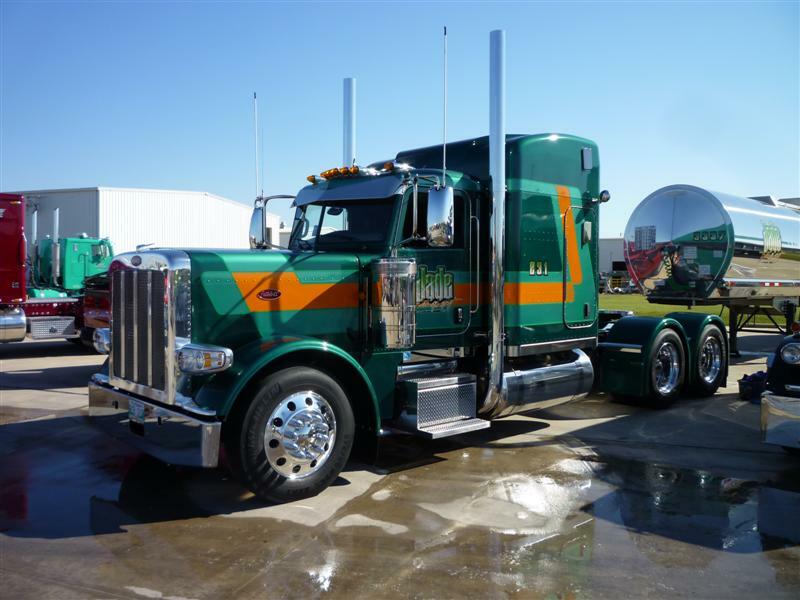 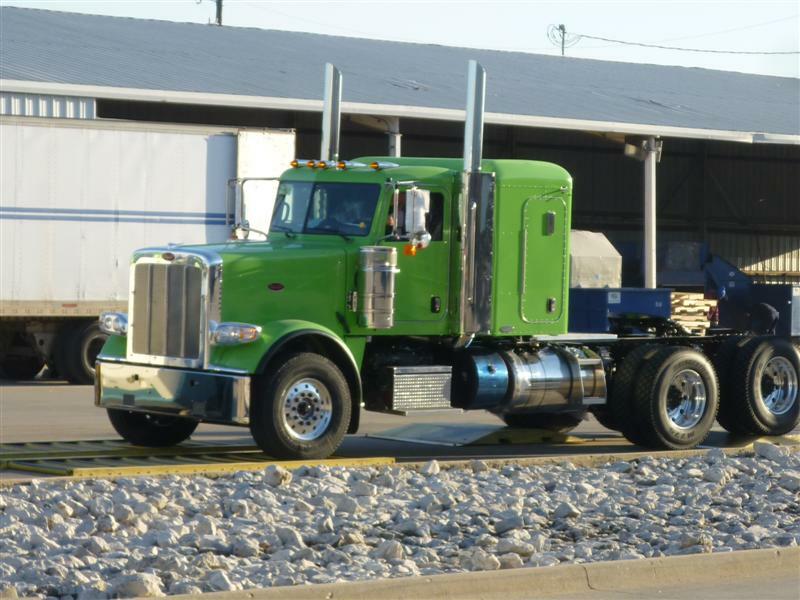 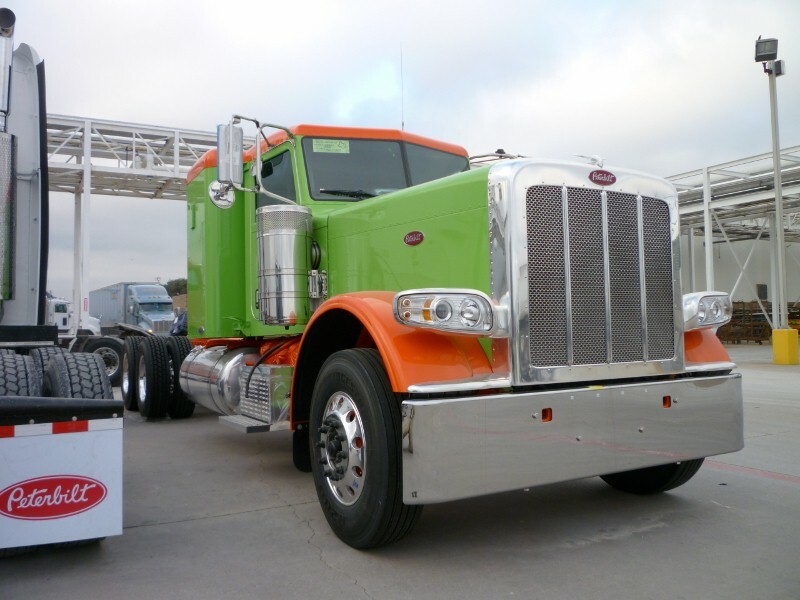 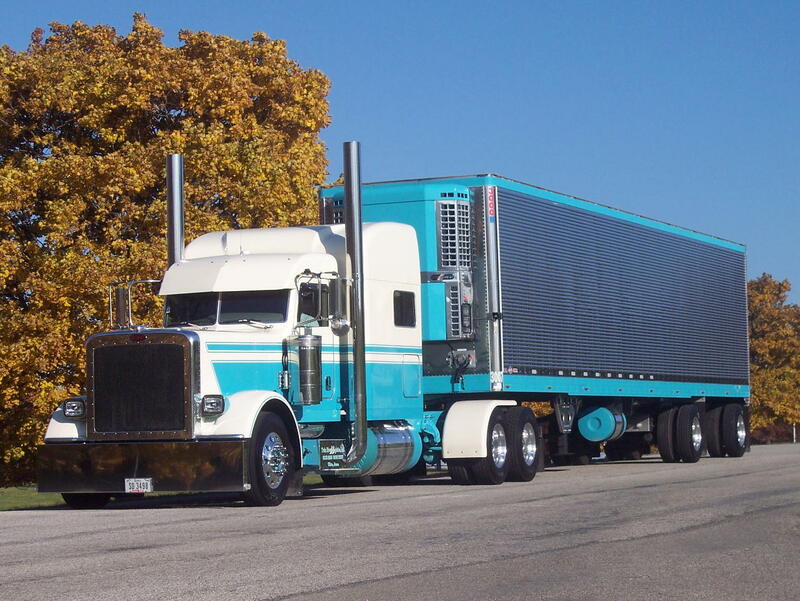 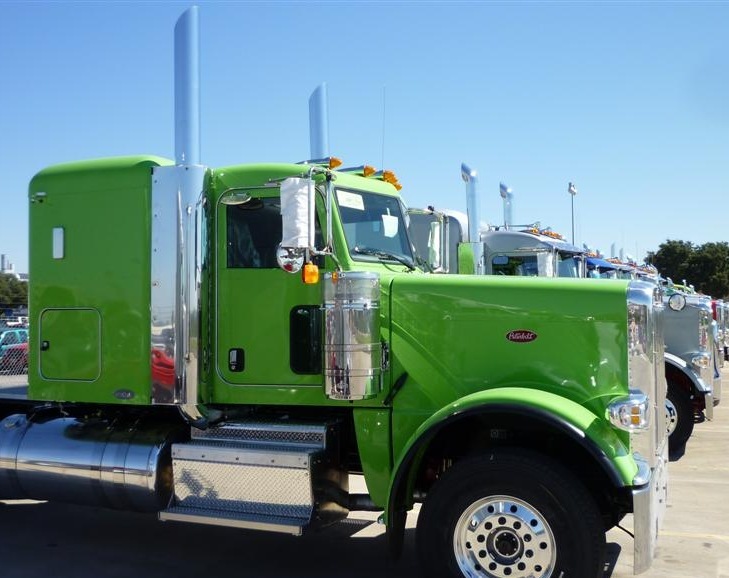 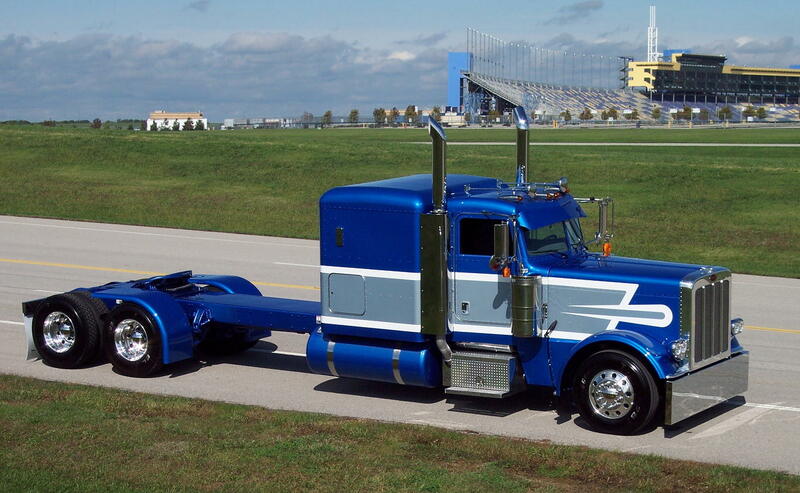 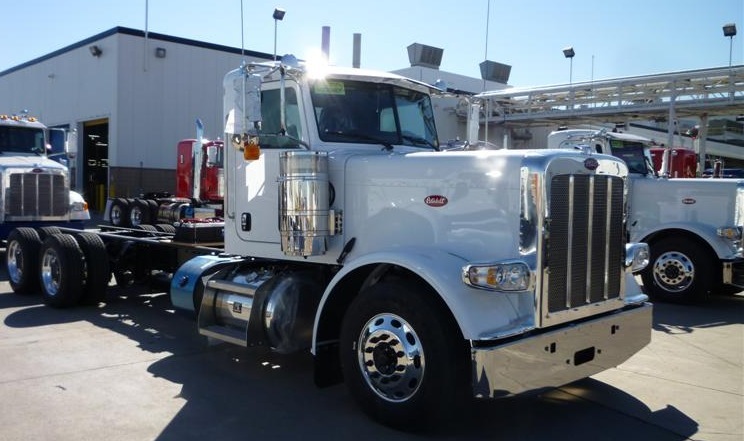 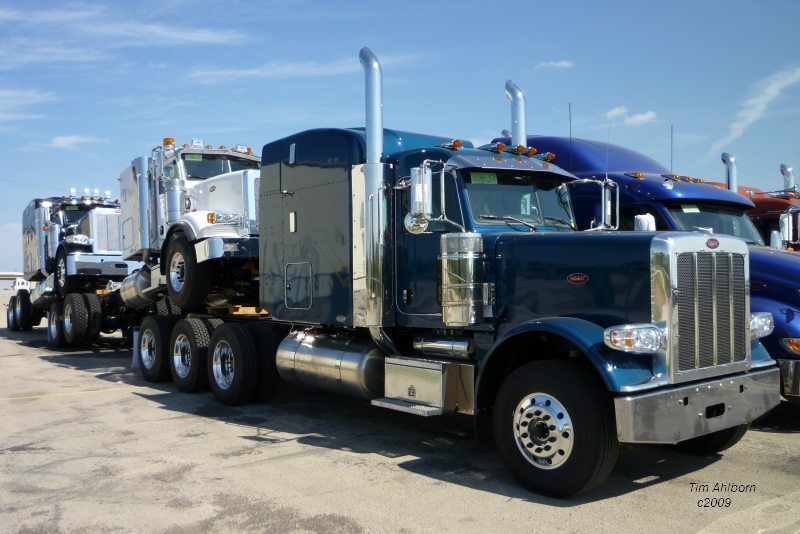 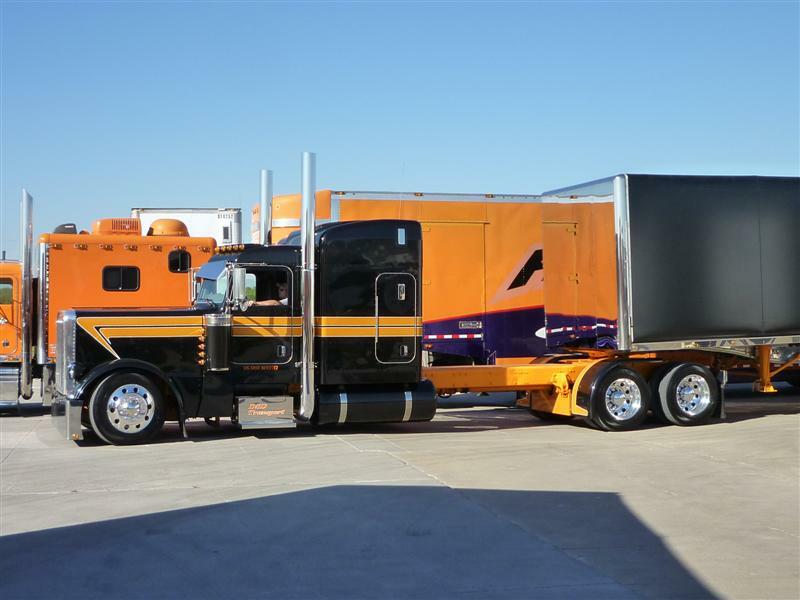 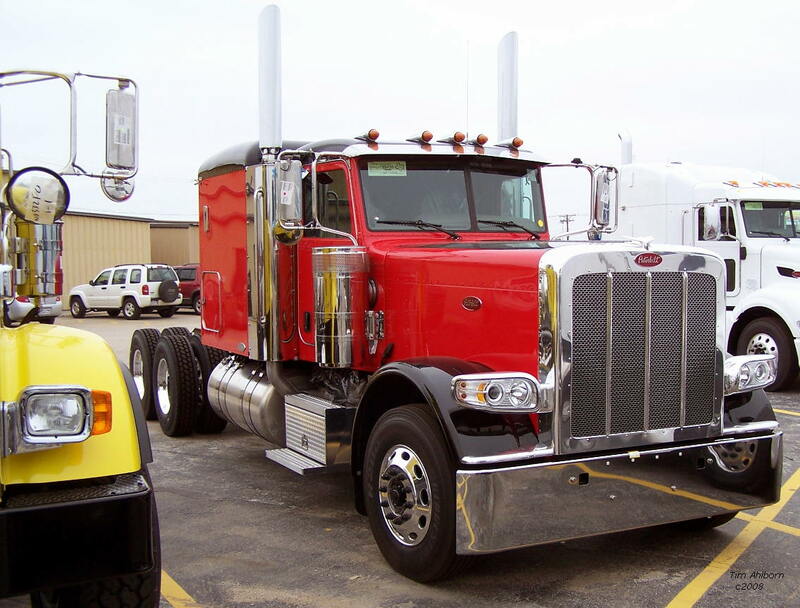 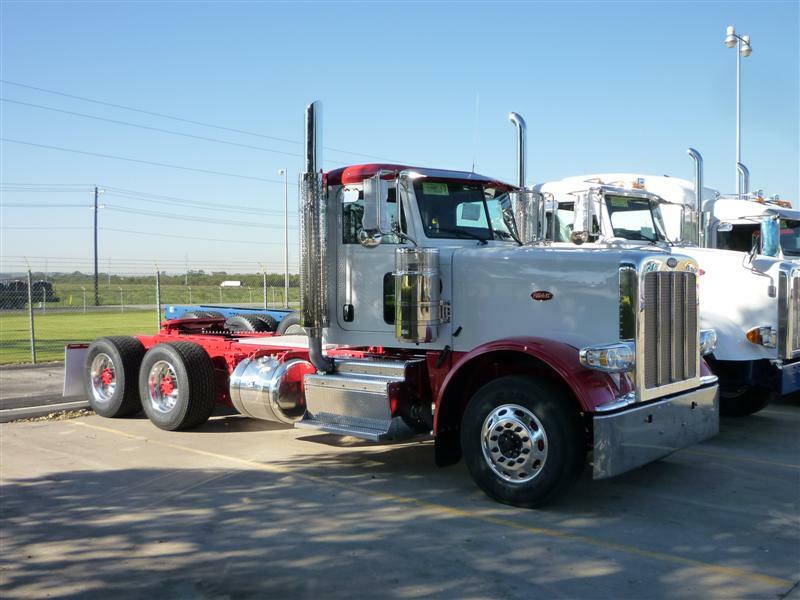 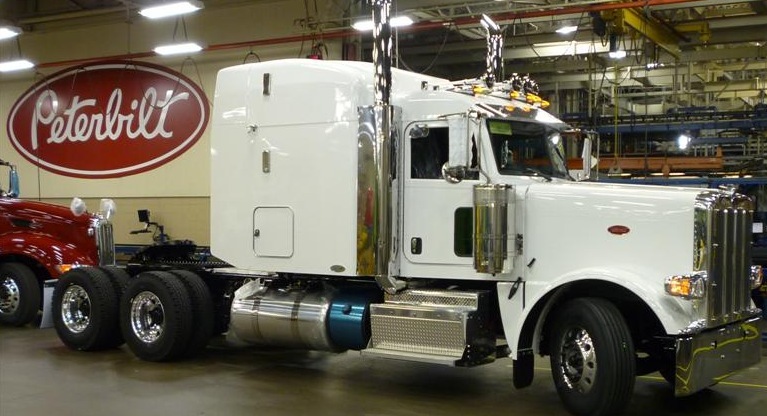 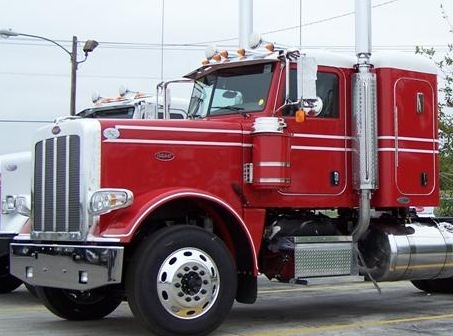 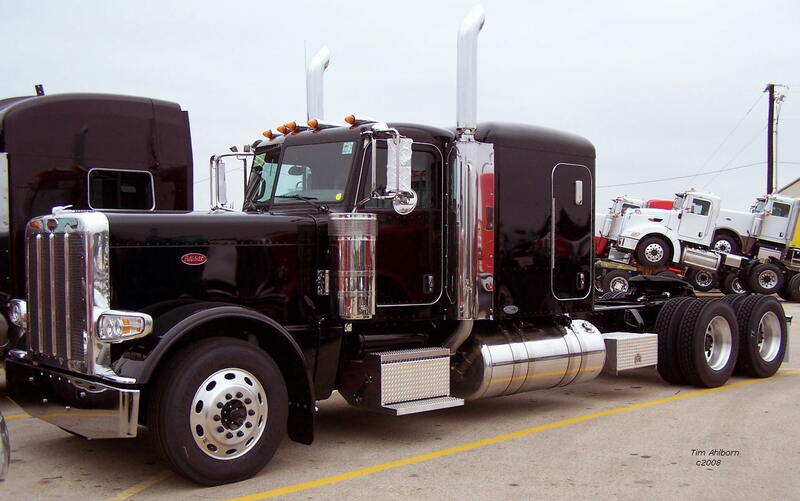 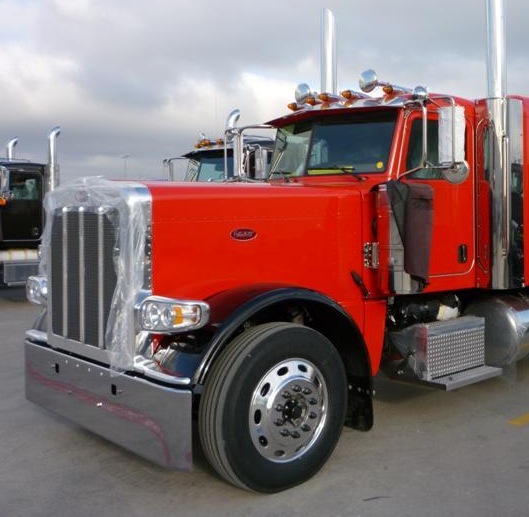 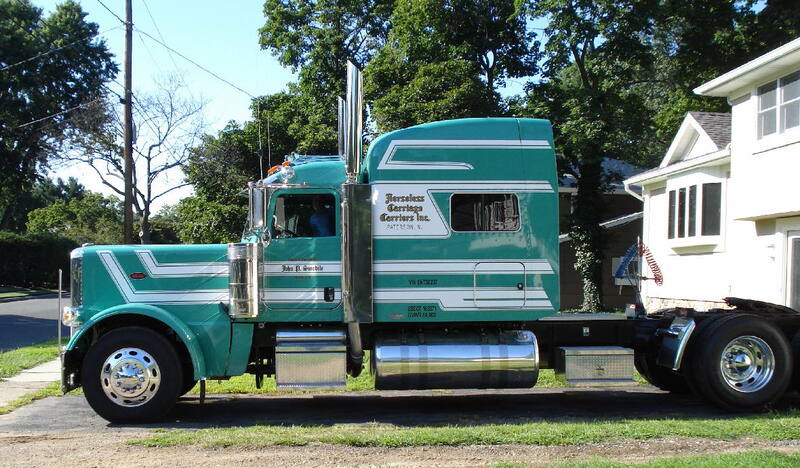 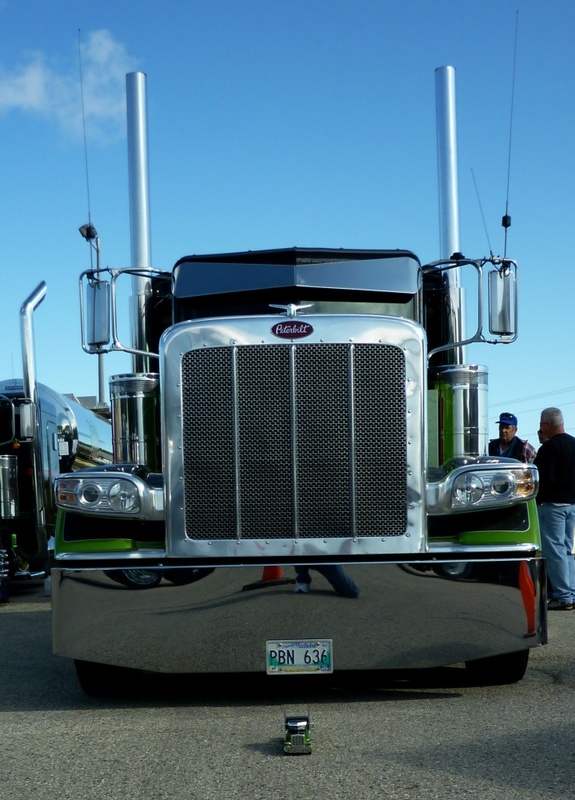 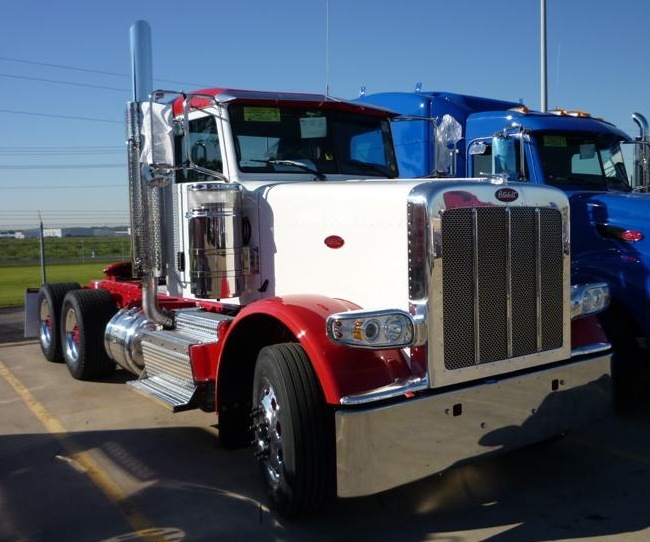 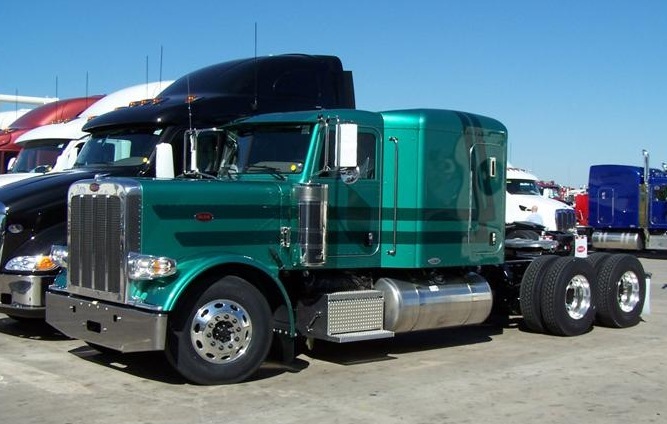 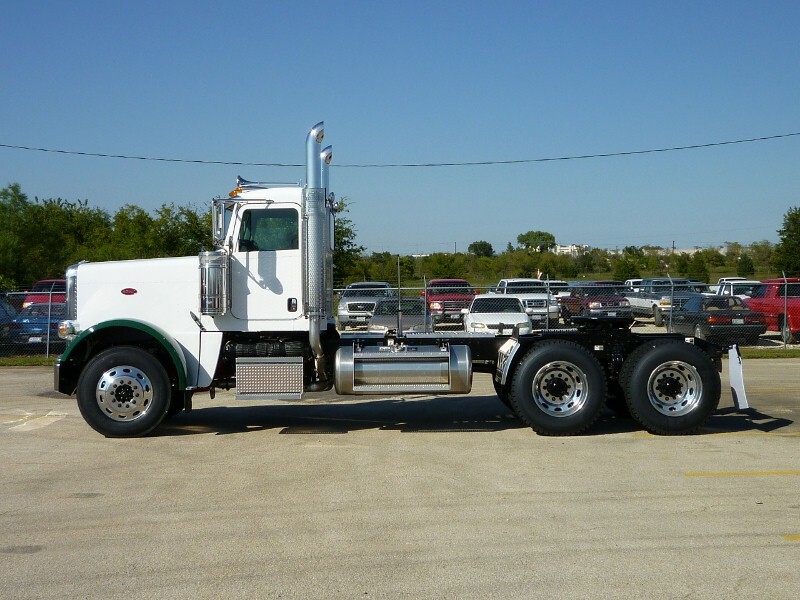 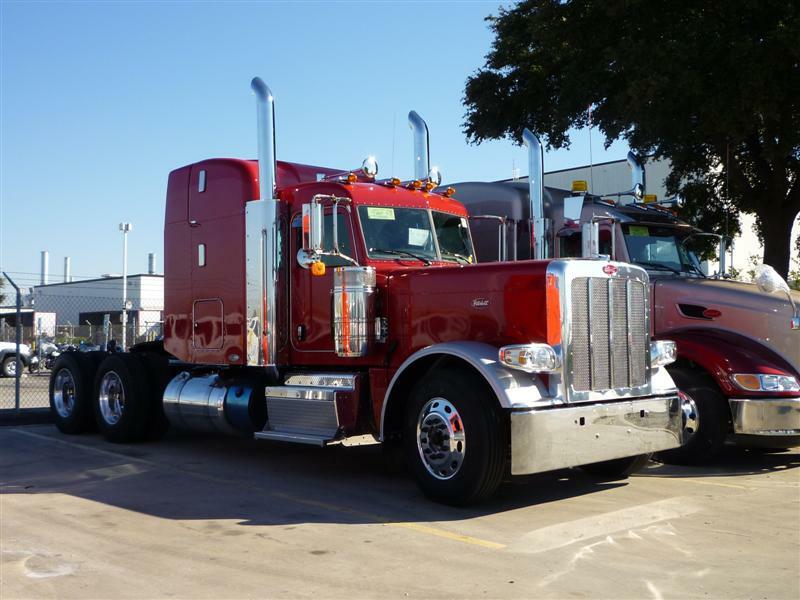 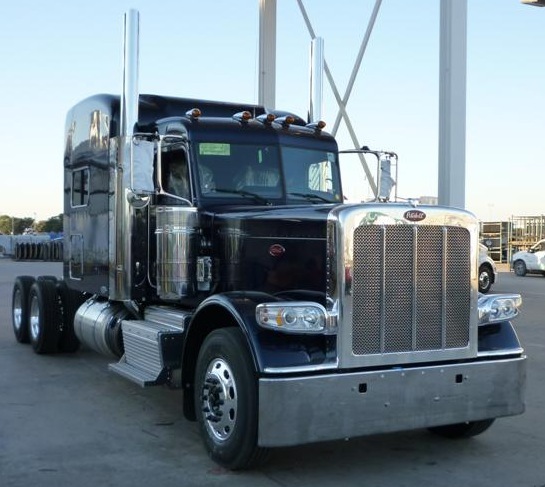 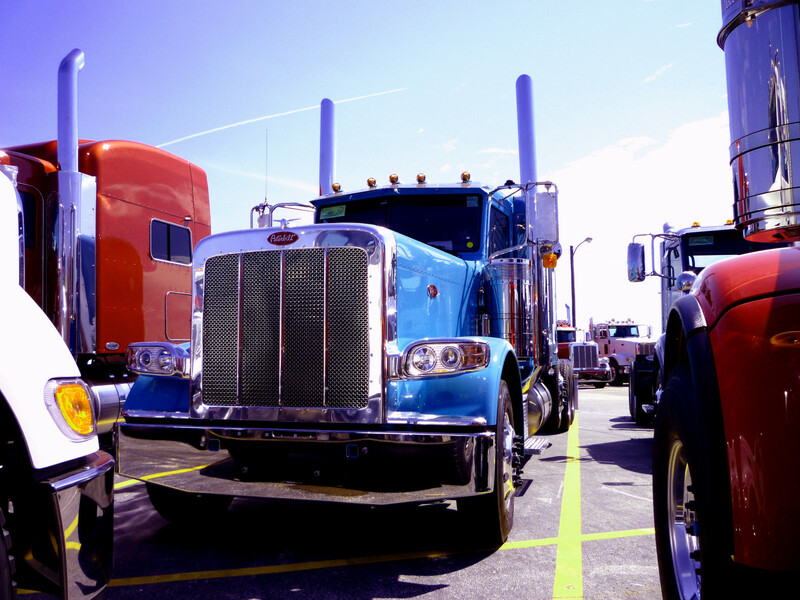 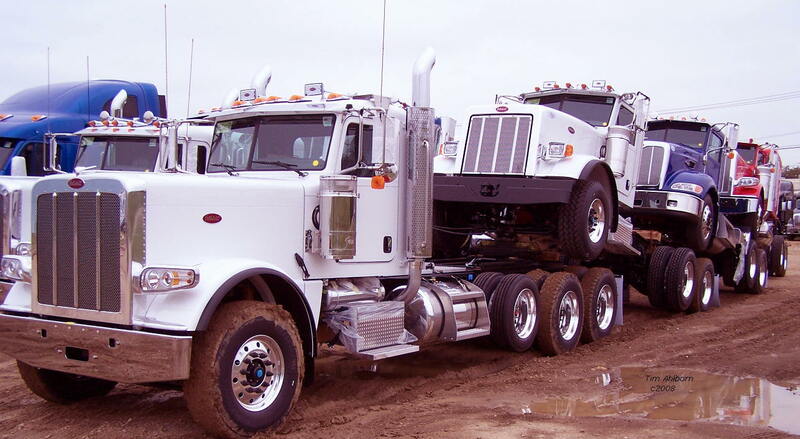 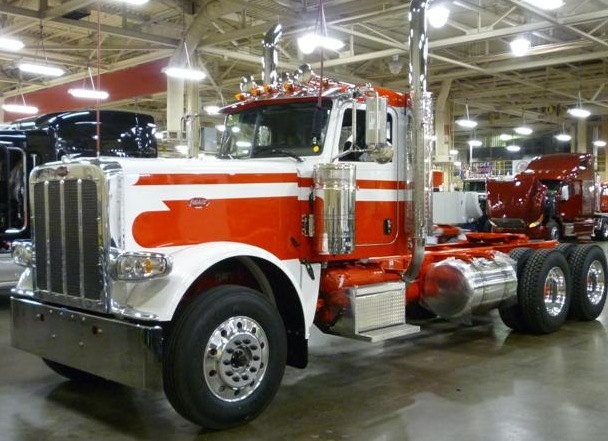 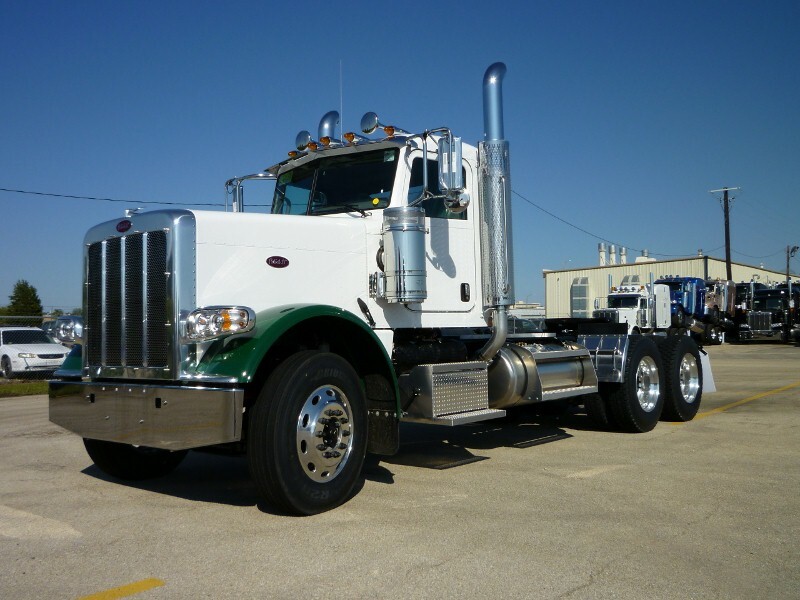 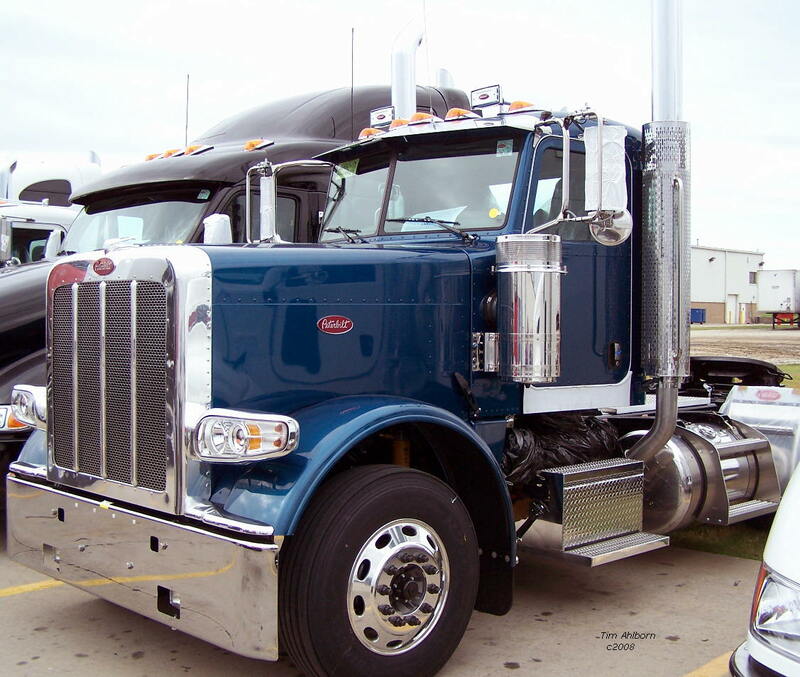 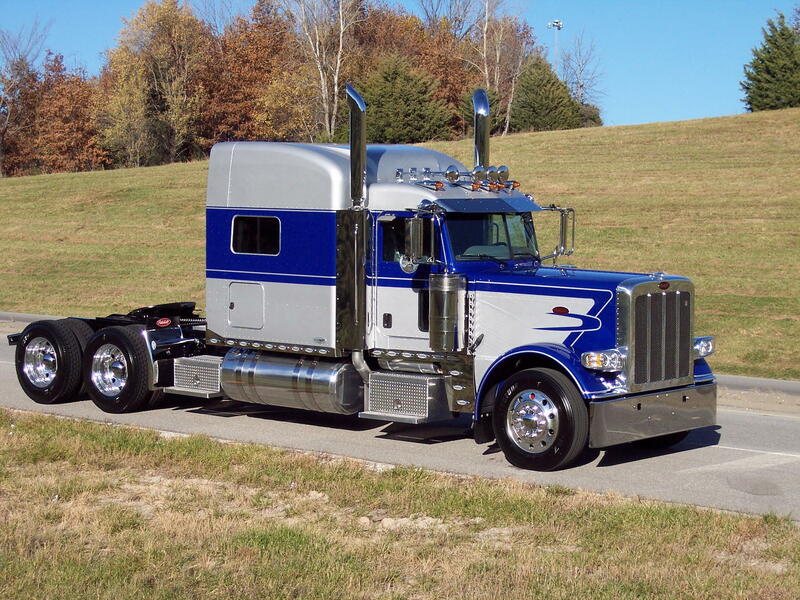 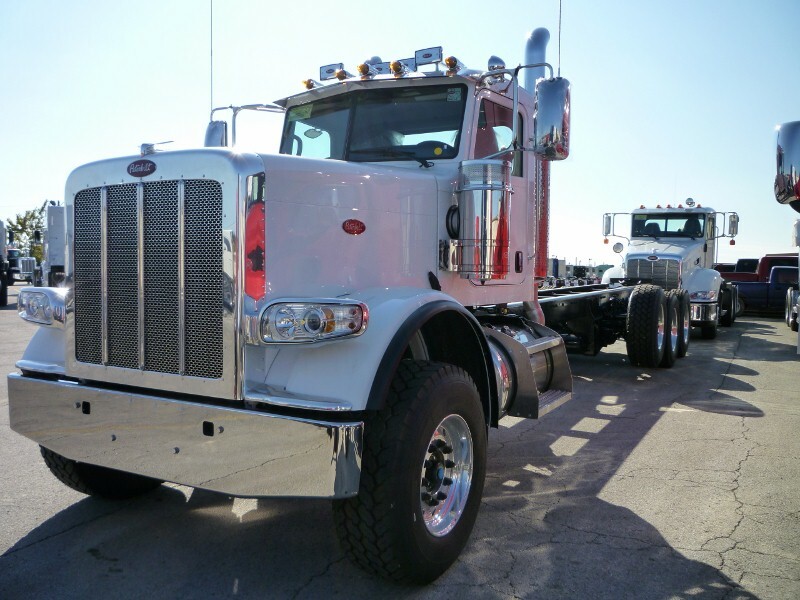 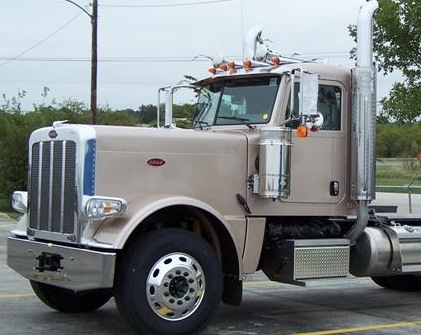 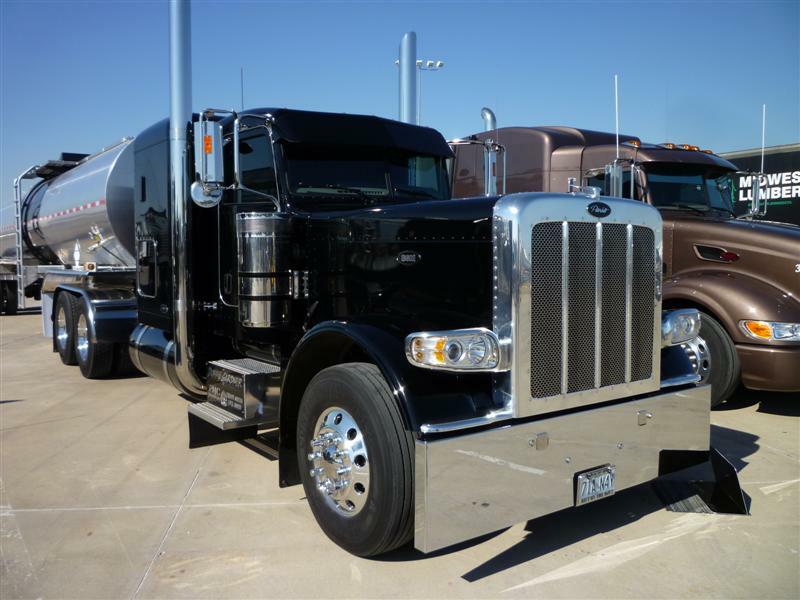 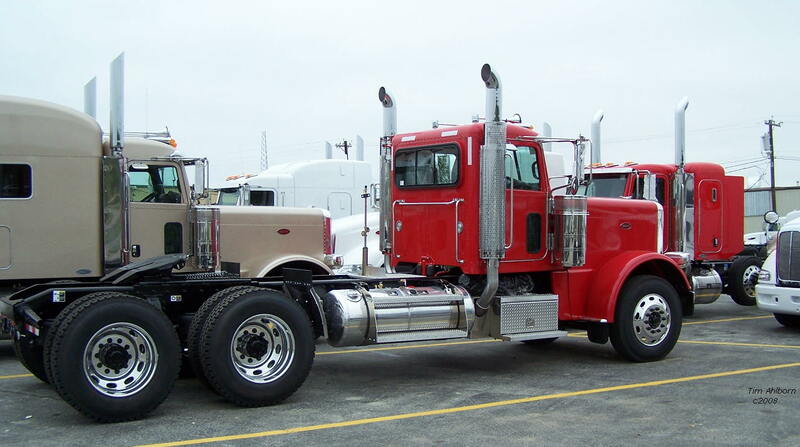 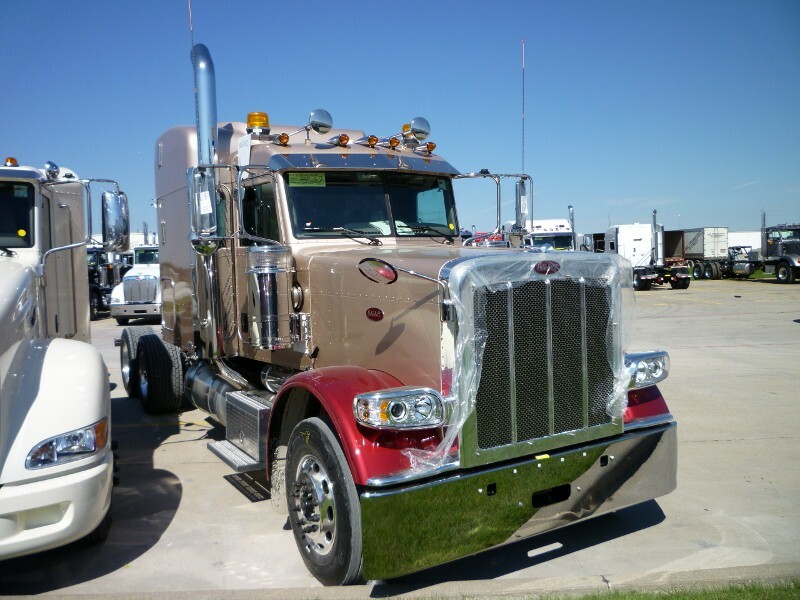 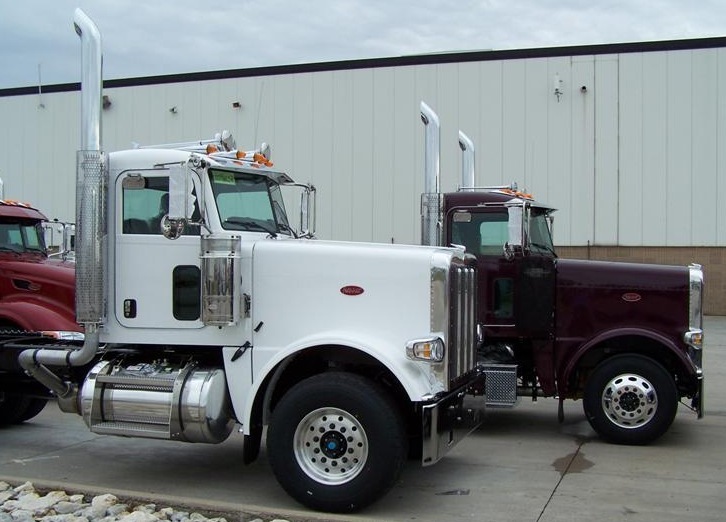 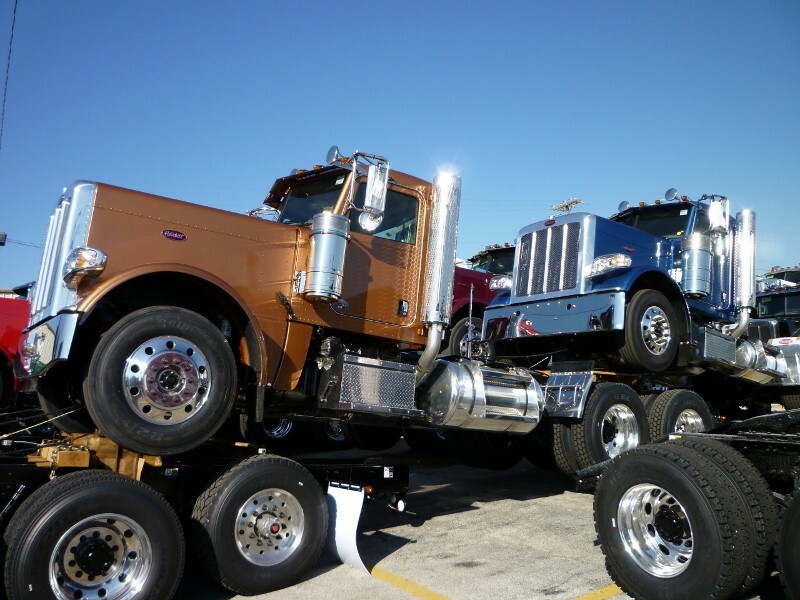 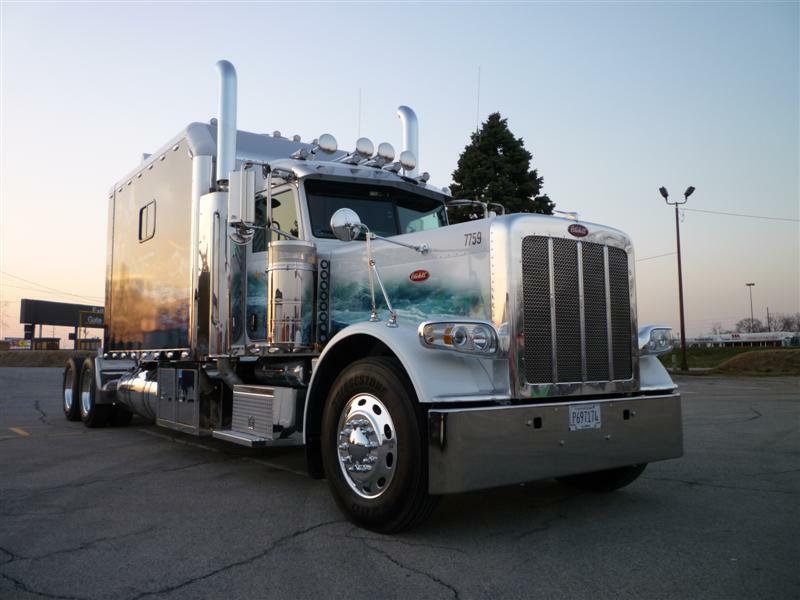 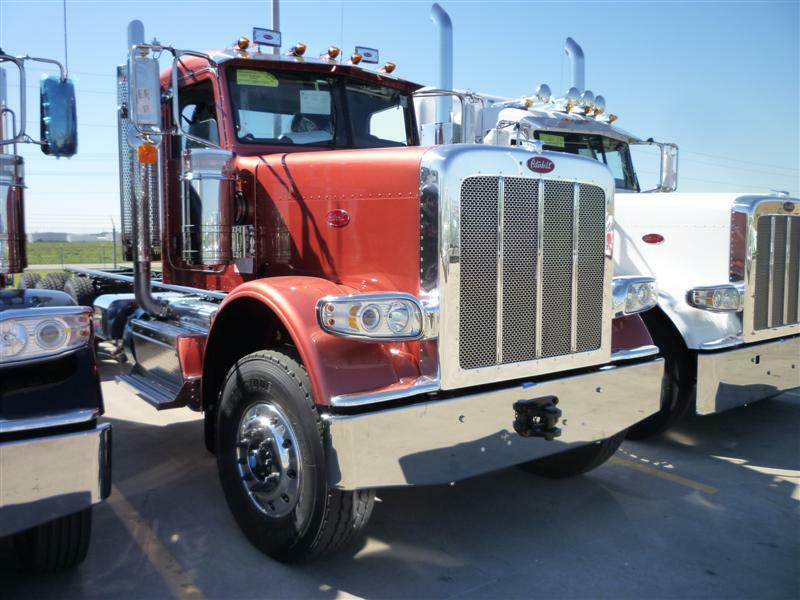 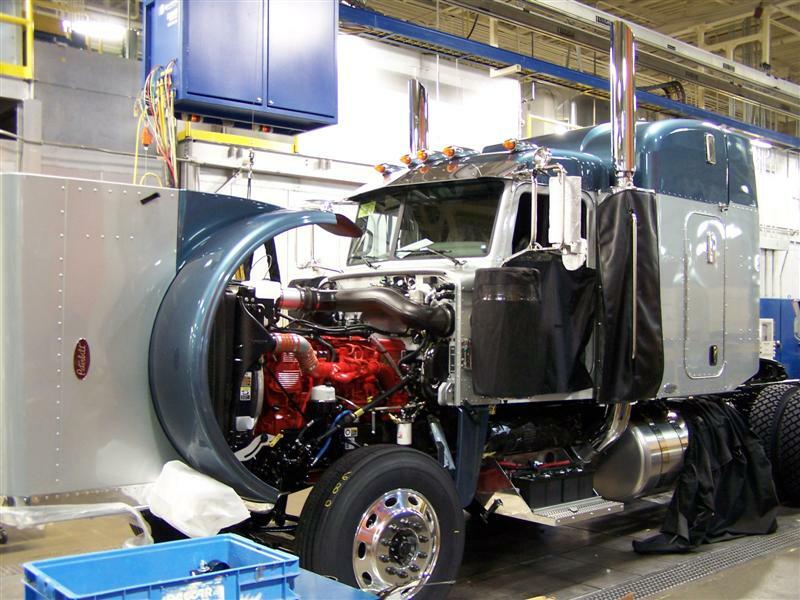 The Peterbilt 388 and 389 are difficult to differentiate from one and other. 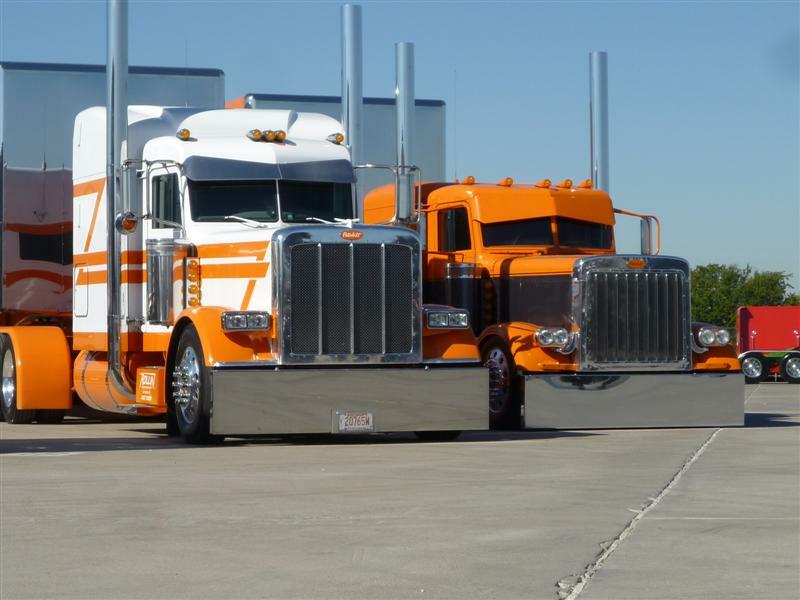 The looks are very similar, but there are subtle difference outside of the length of hood. 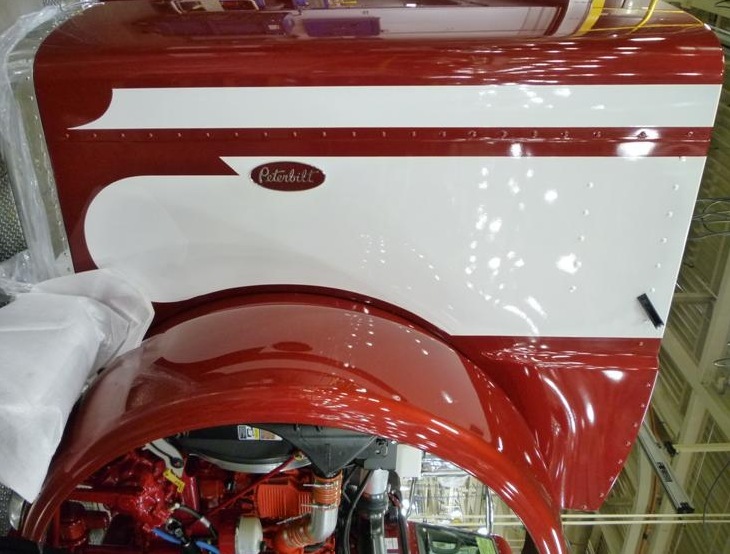 The most noticeable location to spot the difference is at the back of the hood where the 388 will have more skin showing above the panel seam and the row of huck rivets than a 389. 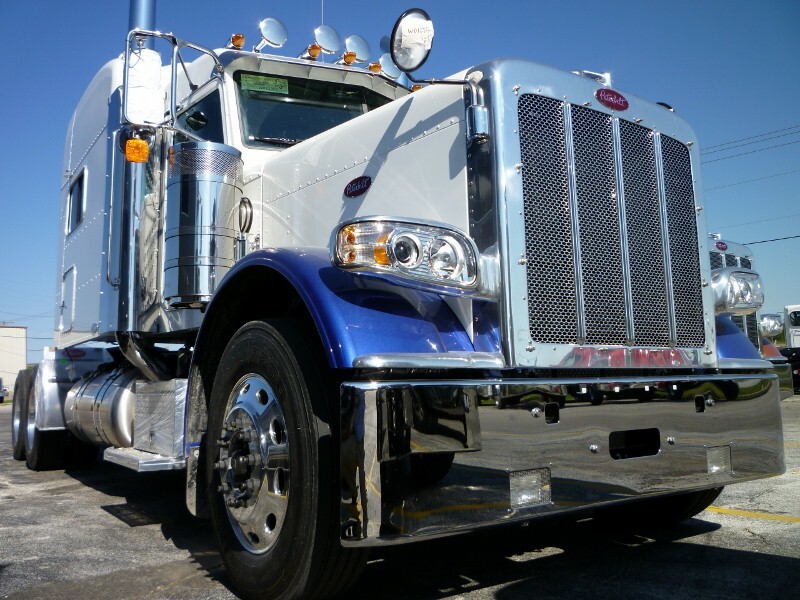 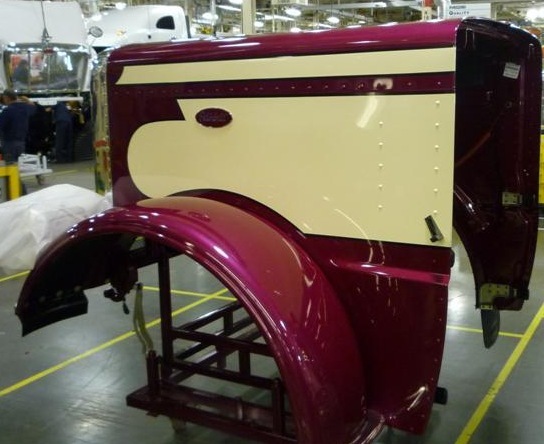 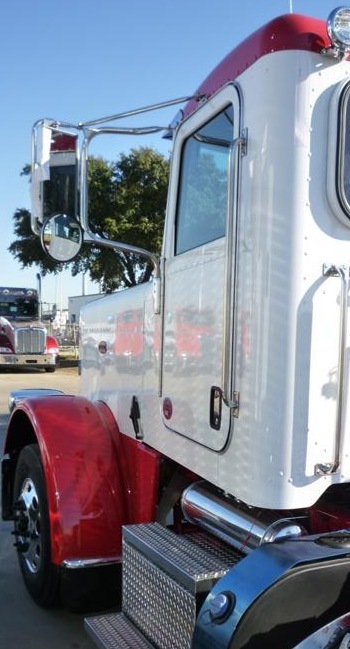 The 388 is a 123" Bumper to Back of Cab aluminum hood premium conventional. 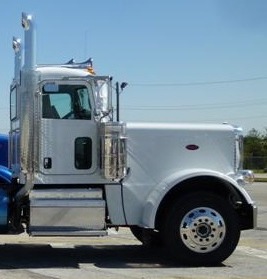 The 388 cab sits higher off the frame rail than the 389. 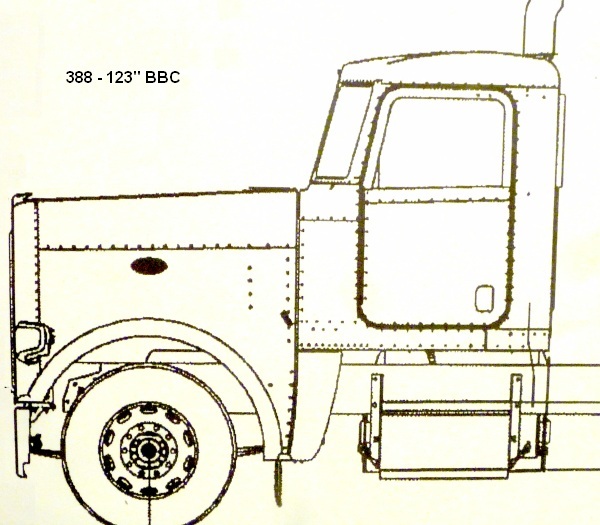 388 slope is more pronounced than that of the longer 389. 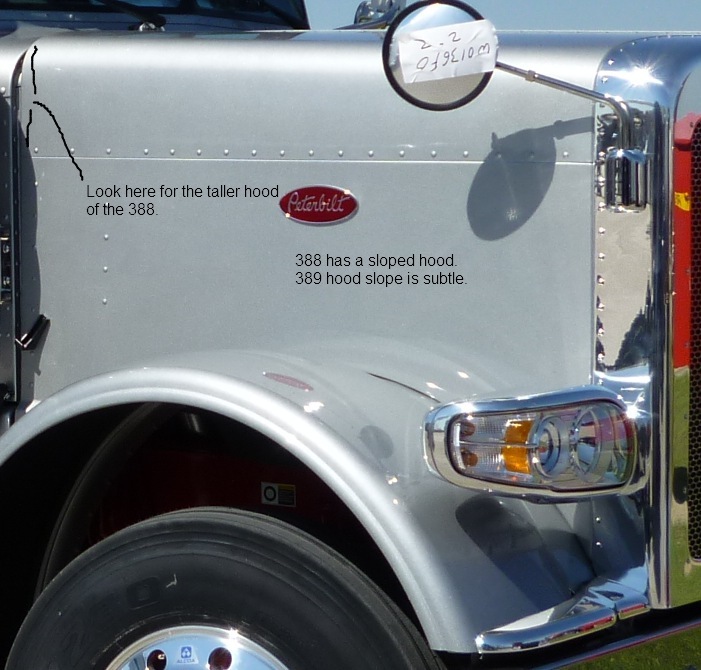 The difference is quite noticeable on 388 at the rear of the hood where the difference in height from the panel seam and huck rivets is much taller on 388. 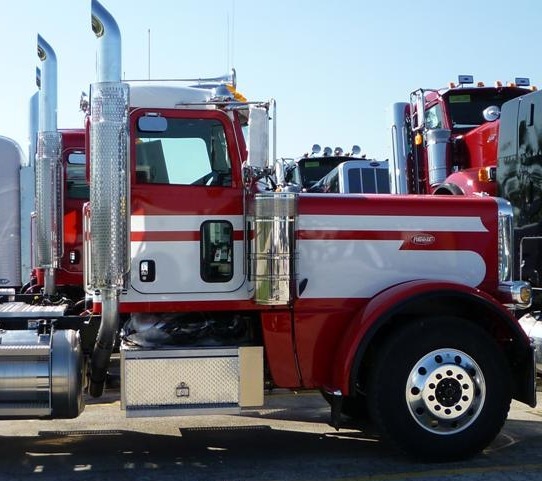 The 388 replaced the 379-119"
Both 388 and 389 share the same crown, grille, headlamps, fenders, front and rear fender brackets, cooling components, engine and drivetrain options and stepboard skirts. 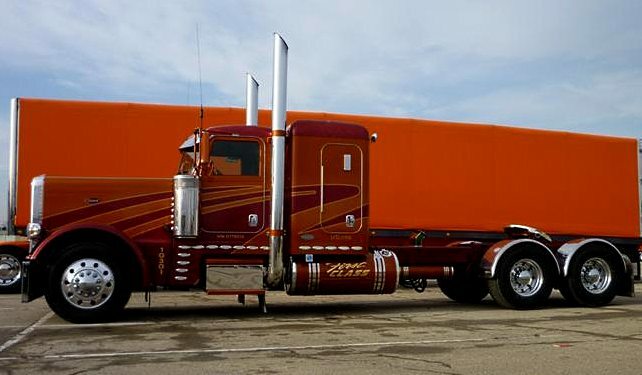 Clint Moore 388 single drives. 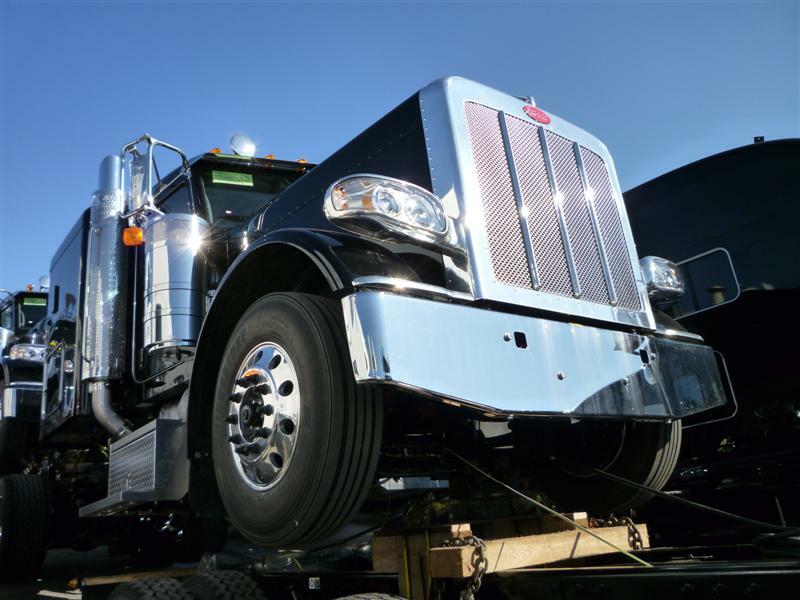 388 is available with a special option Car Hauler hood that shares the cab height of the 389 with virtually no slope to the top of the hood. 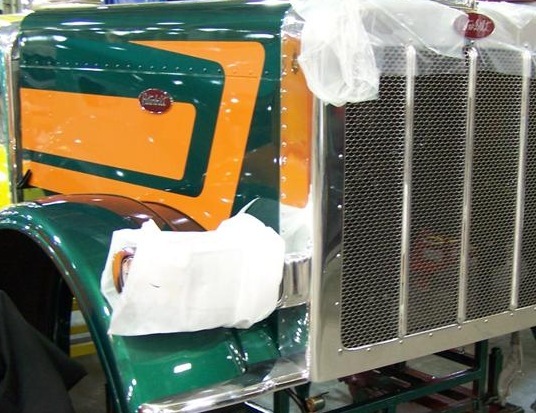 The Car Hauler hood remains 123" BBC. 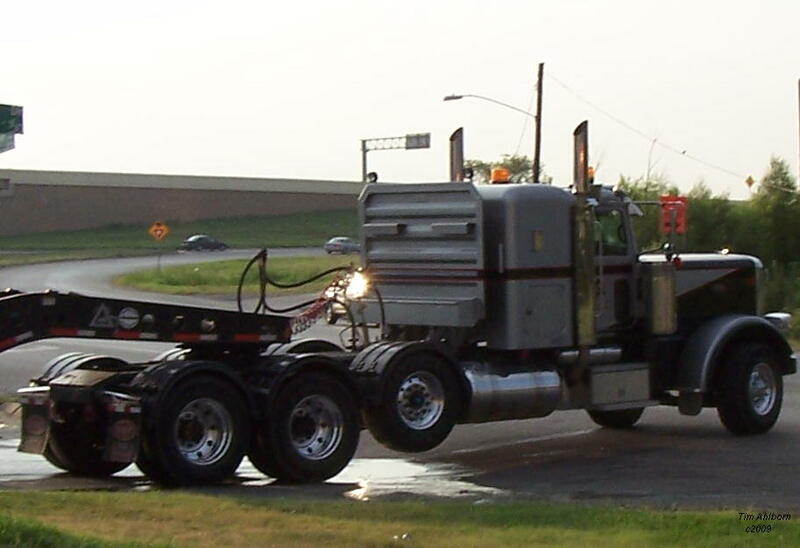 This is a 388 car hauler hood with 48" sleeper and a new low-flat roof installed by an upfitter(right). 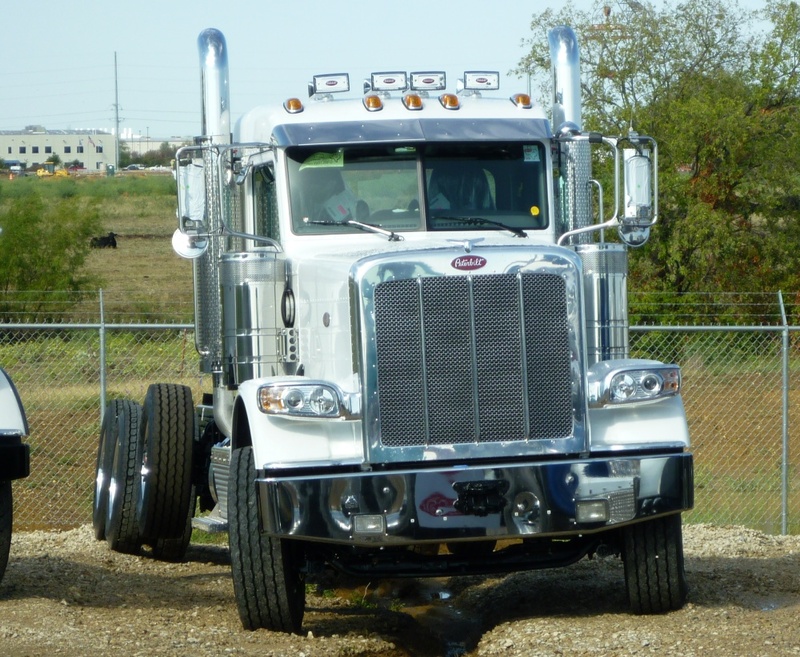 The 389 is a 131" Bumper to Back of Cab aluminum long hood premium conventional. 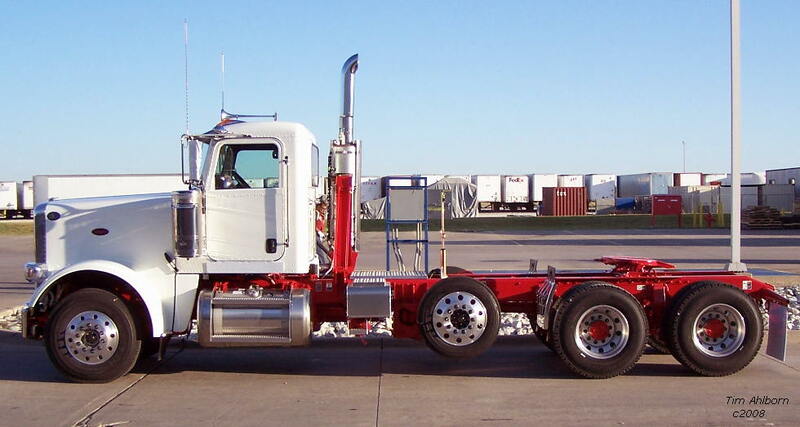 The 389 cab sits lower off the frame rail than the 388. 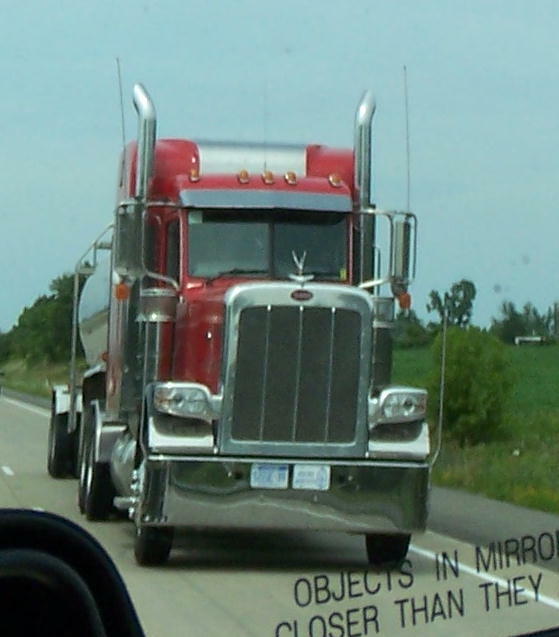 389 has a very subtle slope towards the front. 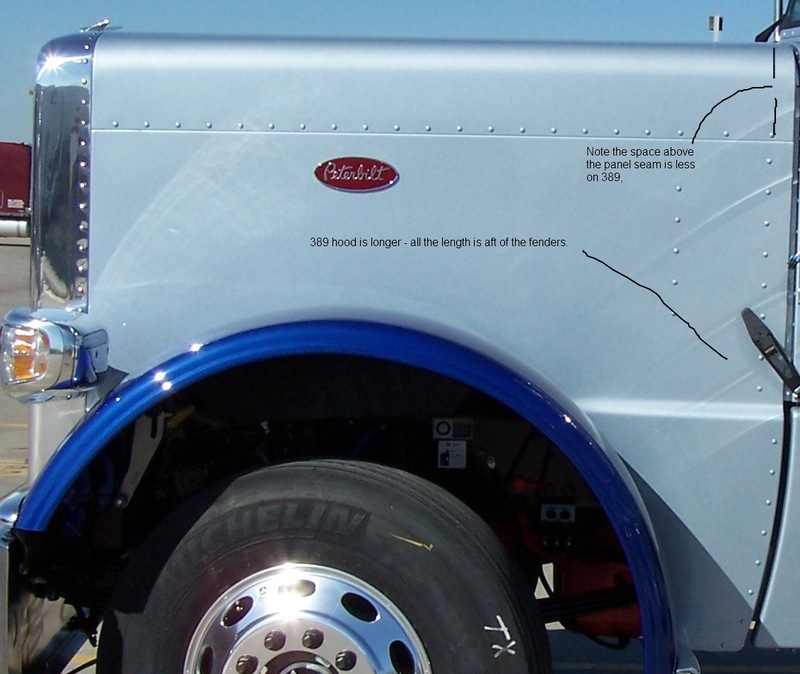 The additional length of the 389 hood compared to a 388 is made up aft of the fenders. 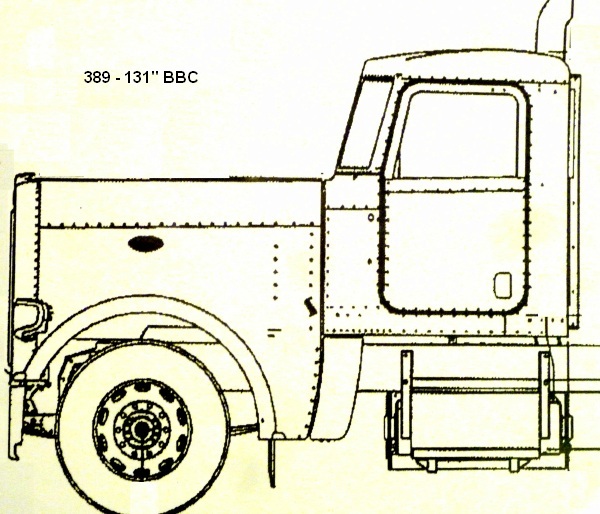 Early 389 had unique lower exhaust elbows. 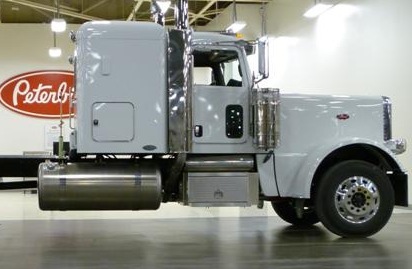 This changed with the 2010 emissions. 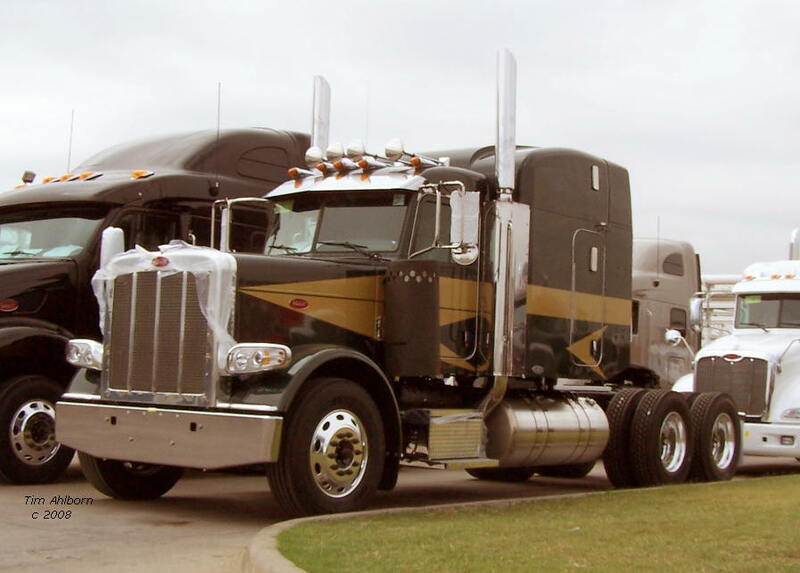 The 389 replaced the 379-127"
389 388 Car Hauler hood. 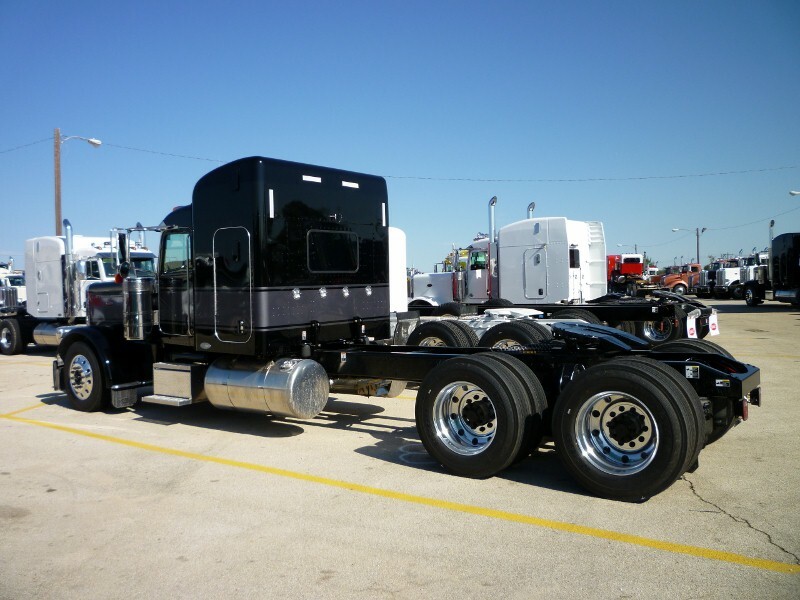 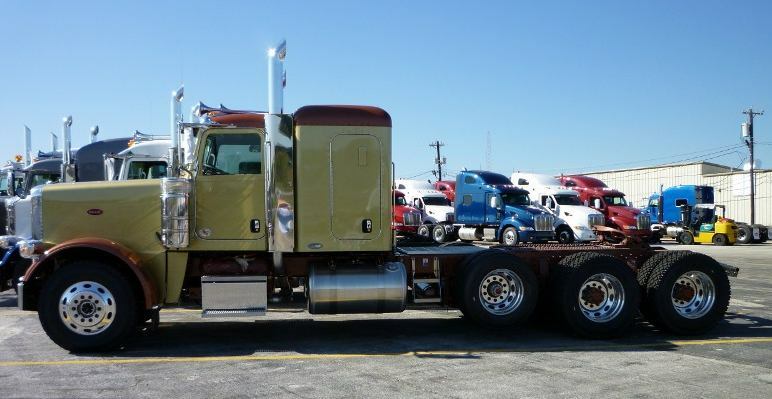 This is the Extended Ultra Daycab option on a 389.